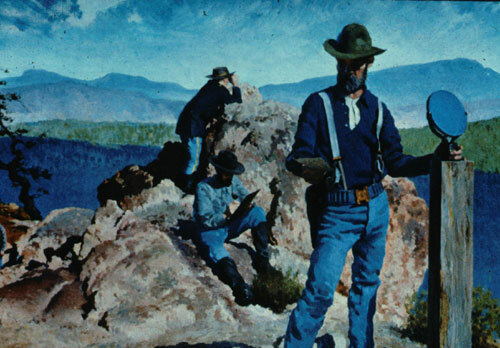 From the San Francisco Peaks to the Sonoran desert, Arizonans past and present have adapted to this land of diversity and often to conditions of climatic intensity. 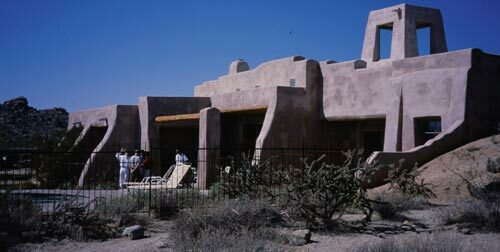 The heat of the desert summer sun and the cold of a mountain winter have had direct impact on the form and shape of our buildings, and the patterns of our behavior. 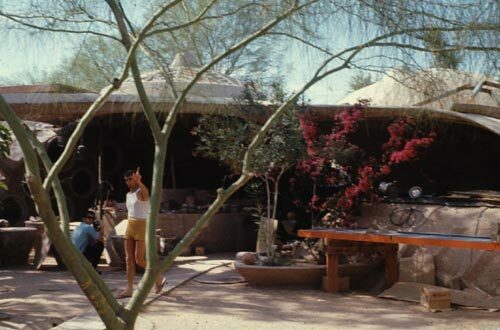 Living with the sun is the characteristic of a truly Arizona architecture, not rooted in national stylistic trends but in environmental conditions, local resources and climatic appropriateness. 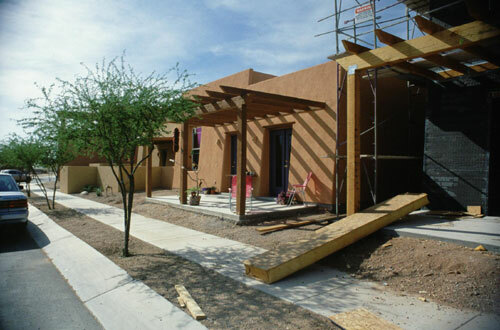 Living with the Sun - Arizona Style recognizes and uses on-site environmental conditions to meet human needs and comfort. 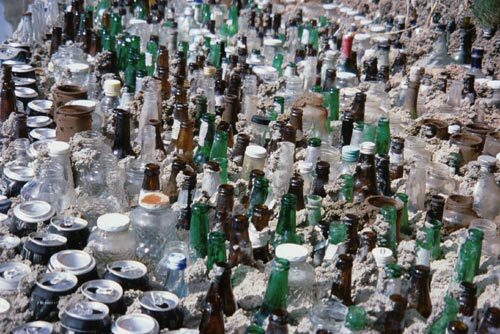 Energy and resource efficient strategies are used to optimize comfort while minimizing environmental resource depletion, and economic waste. 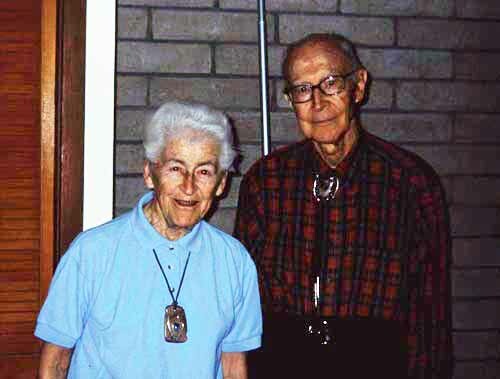 Through time there are examples of Arizonans Living With the Sun. 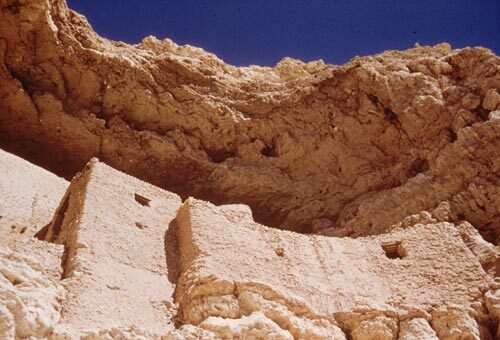 The early cliff dwelling of Montezuma’s Castle, often romanticized as Arizona’s first solar building, does reflect solar design principles. 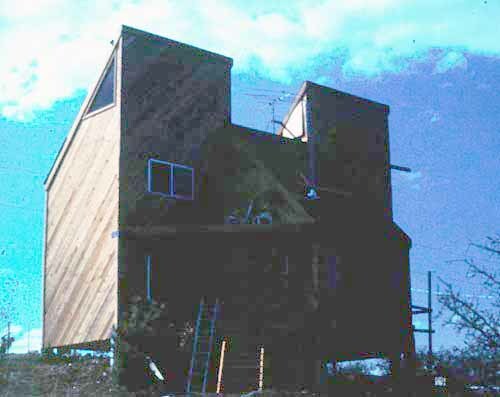 While clearly not “designed” as a solar building, has passive solar attributes including south orientation; deep “eaves” (cave roof) which shades in the summer and allows low winter sun penetration; and thermal mass (solar heat storing capabilities of the stone building materials. 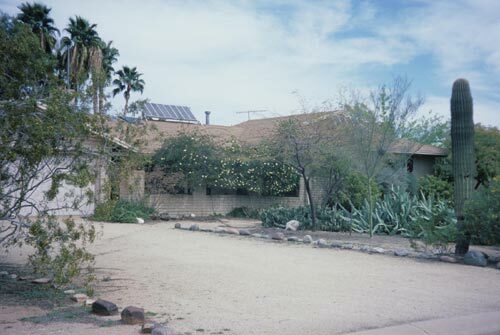 Passive solar water heaters were used on buildings like the historic Ellis-Shackleford house and the historic Tempe Bakery, and both public and private desert buildings responded to the need for shade and cross ventilation. 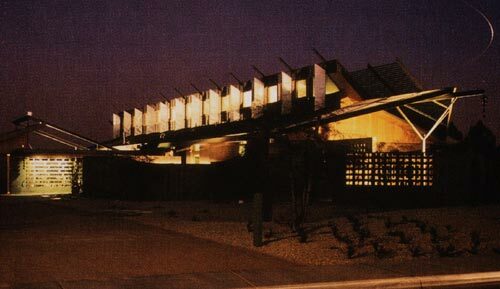 The Yuma Hotel had windows down to the floor and balconies so beds could be pushed outside for a cool night sleep environment. 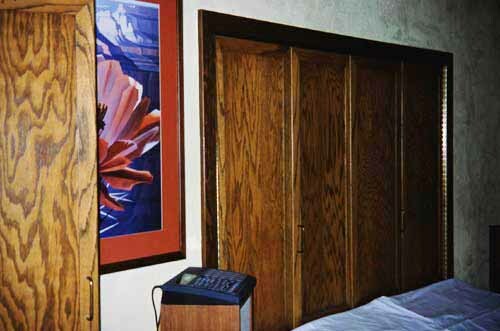 Phoenix hotels had large sleeping porches where rolls of burlap were unfurled and wet down to gain an evaporative cooling effect. 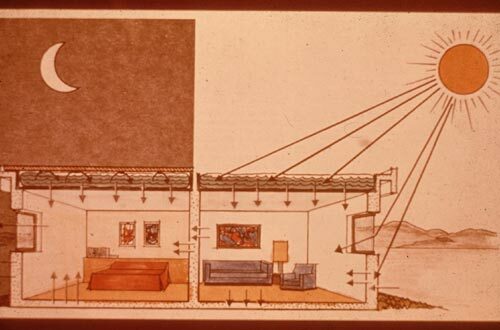 Houses were constructed with proper orientations - broad side with windows to capture the winter sun’s warmth, and with overhangs that controlled direct impact from the high summer sun. 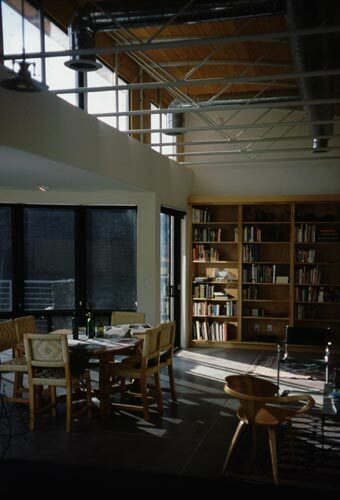 The narrow sides of buildings were oriented to minimize exposure to the intense summer east and west sun. 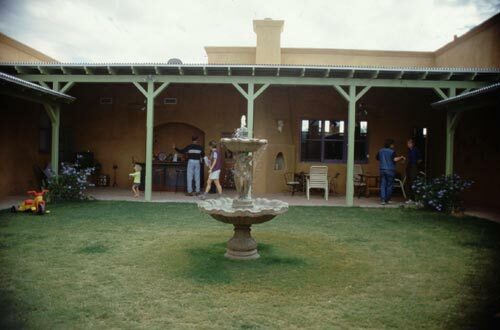 The cooking porch, and even a separate cooking ramada (an idea borrowed from Arizona’s native American and Hispanic population) were often provided to “keep the kitchen heat out of the house in the summer”. 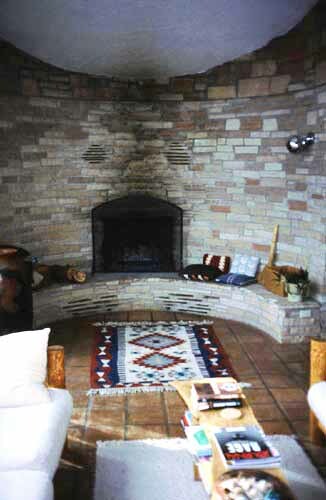 Materials were masonry and adobe, which provided both thermal mass in conditions where heat retention was a benefit, and a thermal barrier where heat was desired to be excluded. 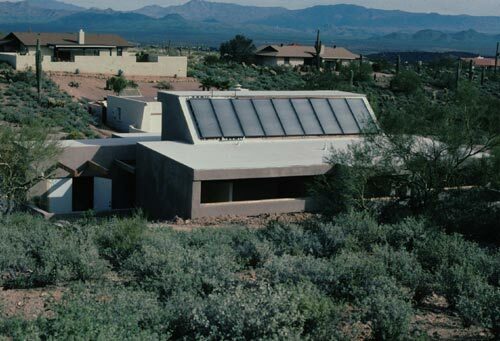 Arizona history is replete with solar applications. 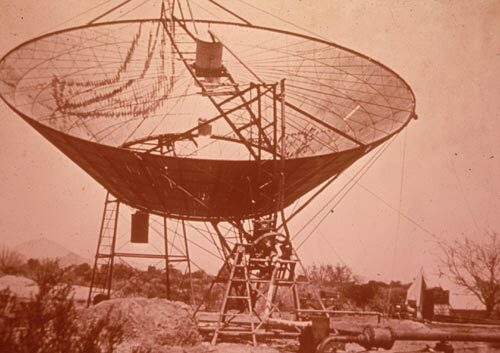 During the Indian Wars, the heliograph was used as a communication device. 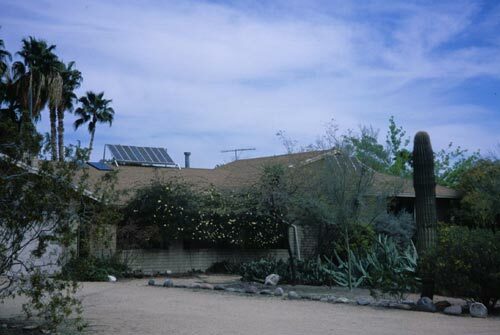 The Aeneas solar pump was installed to irrigate the agricultural lands where Tempe now stands, and Arizona ranch houses in northern part of the State incorporated large porches, open and screened, as cool places for evening use as well as sleeping. 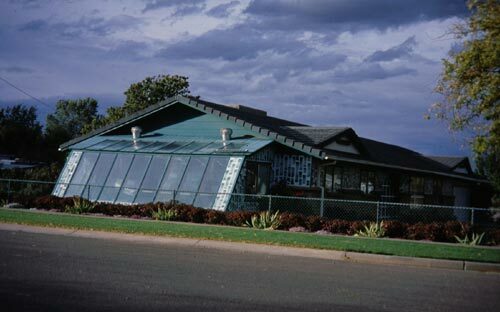 In every corner of Arizona there are solar and green buildings. 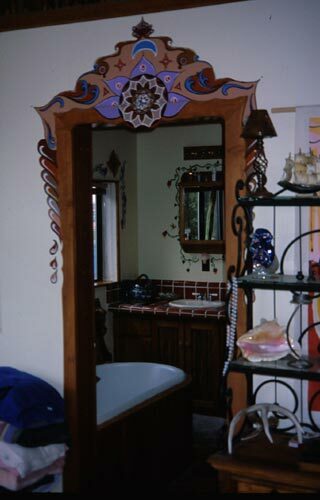 Some constructed twenty years ago, continue to function just fine today. 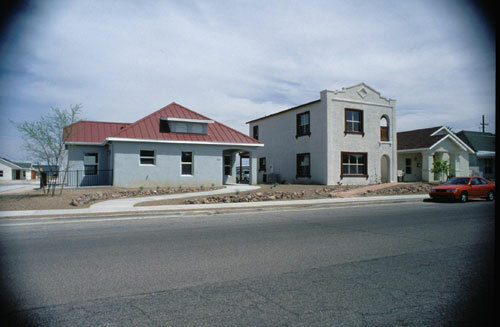 Newer buildings, incorporating current knowledge of passive building design integrated with effective solar equipment of solar water heaters and photovoltaic panels, continue to appear. 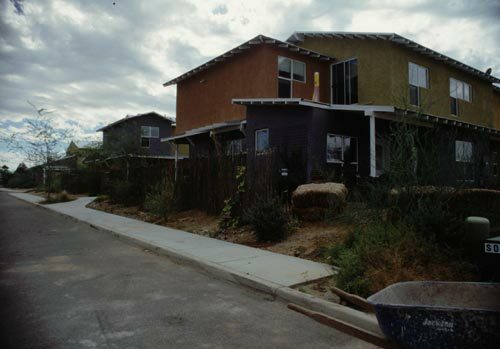 Groupings of solar buildings, as in the Civano subdivision and the Milagro co-housing projects in Tucson, are appearing, and the variety of solar strategies used provide a growing richness in solar building form and shape and architectural language. 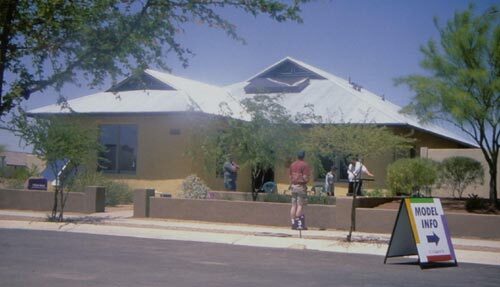 Today, Living With the Sun - Arizona Style can be seen in numerous solar buildings throughout the State every October during the annual tour of solar buildings put on by the Arizona Solar Energy Association (ASEA) in conjunction with the American Society of Solar Energy’s (ASES) National Tour of Solar buildings. 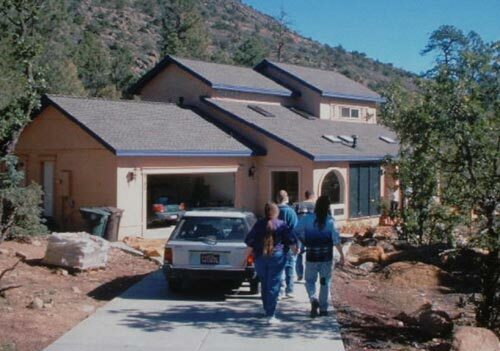 The Arizona Solar Energy Association, a Chapter of ASES, in association with the Arizona Solar Center, mounts and sponsors local tours on consecutive weekends at different locations around the State throughout the month and solar home owners open their doors to the public and share their experiences. 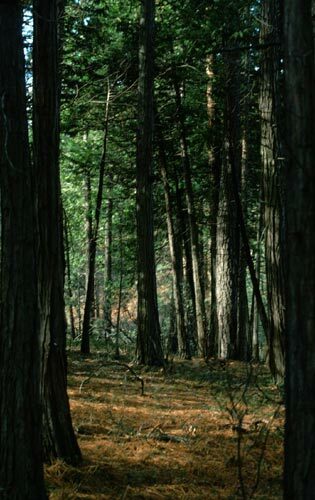 The high desert area of Taylor provides its residents with clear, cold winters, sunny summers, and flat areas where the winds blow. 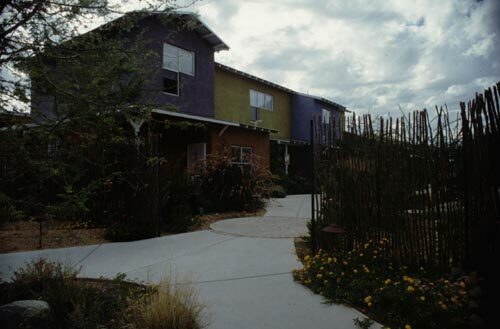 Low vegetation mixed with Arizona independence have resulted in a number of Living With the Sun variations, within the community’s mix of historic and contemporary buildings. 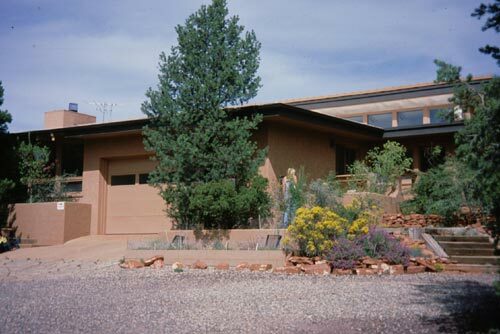 A passive solar heated building utilizing south face direct solar gain, south side living spaces, thermal mass walls and floor. 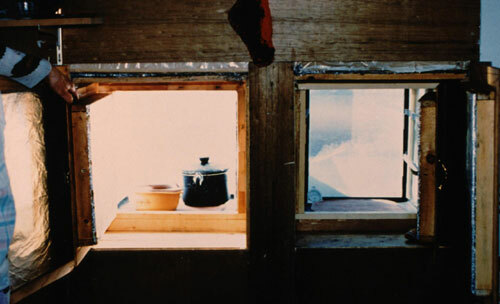 Cooling is by virtue of the thick thermal walls, effective cross ventilation and a centrally located, operable oculus window at the top of the building. 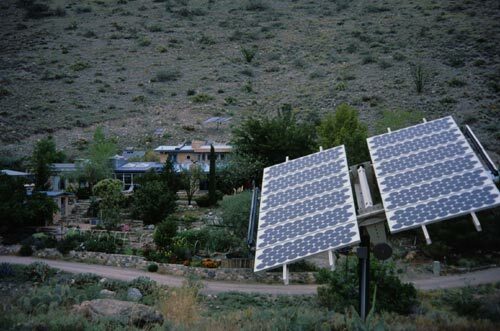 Solar equipment includes energy efficient lighting and resource conserving fixtures and a ground mounted batch water heater. 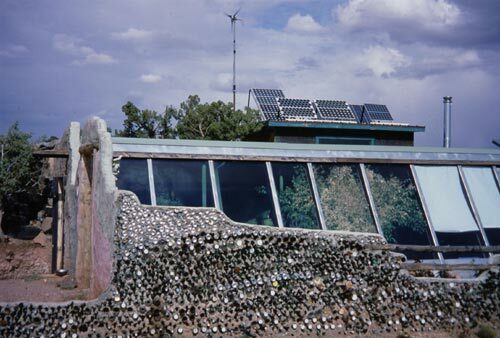 This Earthship building, utilizing interlaced tires packed with earth for both structure as well as thermal mass, is heavily integrated with the earth on its north side and has thermal mass walls and floors. 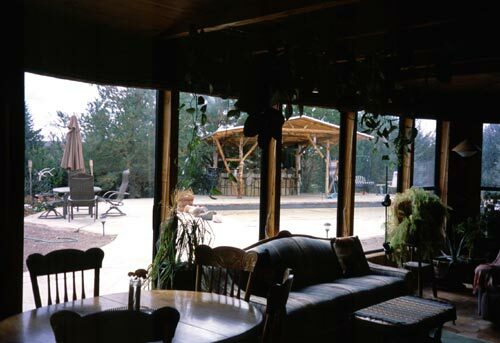 Full glazing on the south to allows for passive direct solar gain for heating and the thermal mass structure retains gained heat and releases it back to the spaces to maintain a comfortable setting. 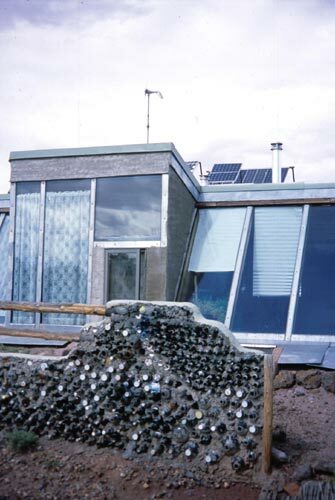 Recycled materials and the earth of the site provide effective thermal mass as both a barrier to intense cold as well as summer heat, and a wonderful medium for solar heating system. 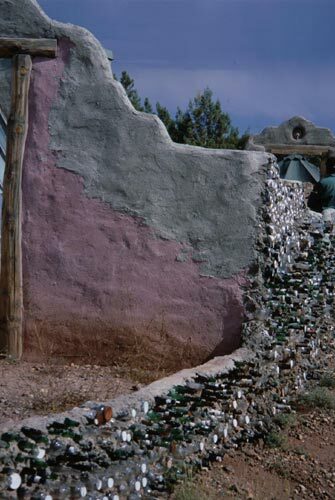 Recycled materials also are used in the buildings’ decorative courtyard walls. 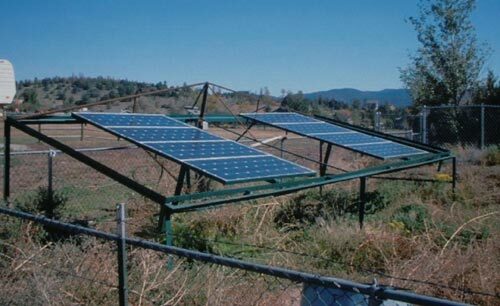 Renewable energy equipment include solar water heating system, wind generator, and photovoltaic panels. 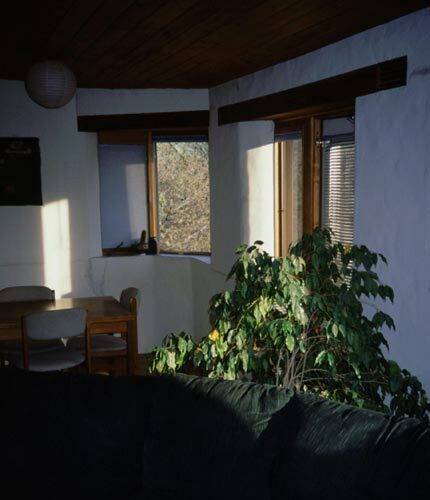 Backed into a south facing slope, this building opens itself to the south sun for passive system direct gain heating using south facing solar windows and thermal mass tile floors and thermal mass walls. 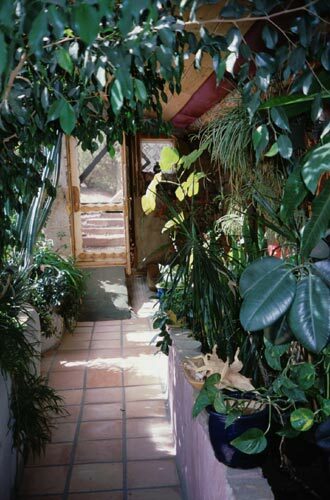 The 2 story structure has living spaces oriented to benefit from the winter sun and the building has an air lock entry zone reducing the negative condition of heat loss whenever people come and go. 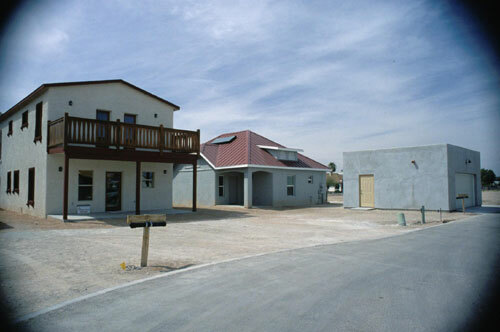 Equipment includes energy and resource efficient fixtures and a batch solar water heater. 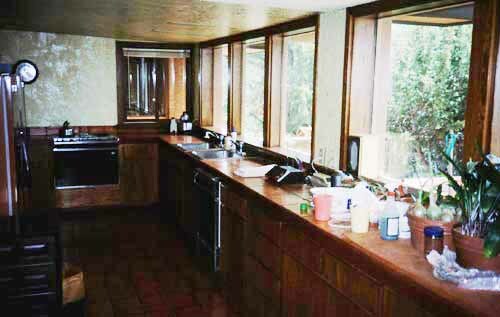 A simple thermal mass structure with south facing windows for direct solar gain and the inclusion of a solar green space for both plant production as well as for heat, and built in solar ovens on the south face of the kitchen. 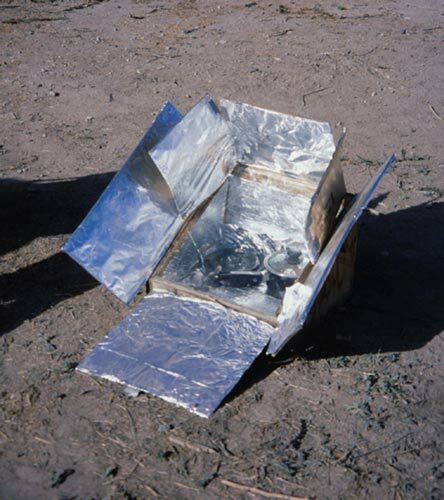 Barbara Kerr is a long time common-sense solar and resource conserving advocate and is internationally known for her work in solar cooking and resource independence. The structure is the headquarters for an institute which teaches people from around the globe the ease and wisdom of Living With the Sun. 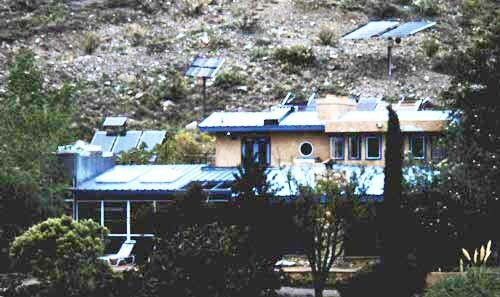 Numerous houses in this part of the state incorporate solar greenhouses to existing building for both heating as well as vegetation. 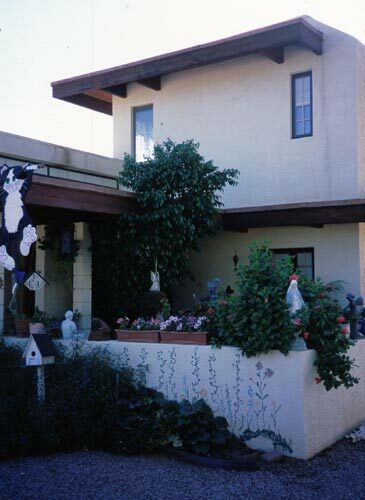 These attached green spaces are simple and cost effective, mounted on the south side of houses. 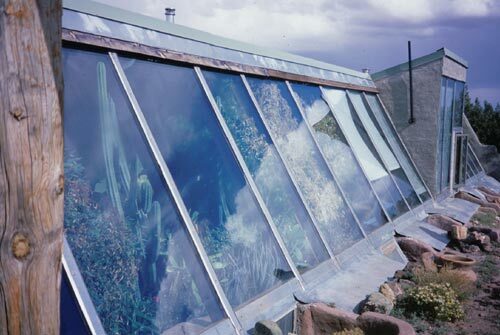 These attached greenhouses are a combination of the Direct and Indirect Gain methods of heating. 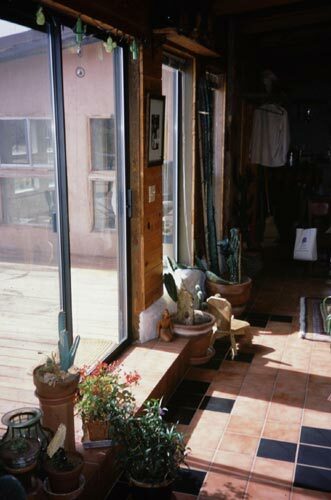 The sunspace is heated directly and the gathered heat can be allowed to transfer into other parts of the building by the operation of existing doors and windows in the building’s primary south wall. 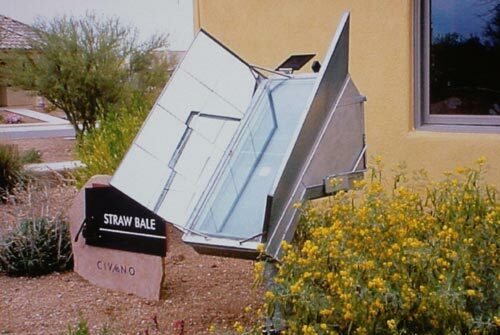 these can be opened or closed to control and moderate the heat from the greenhouse to the living spaces. 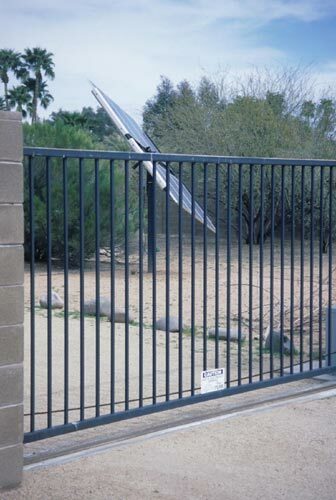 Even the Sedona park department incorporates solar into their equipment and community life. 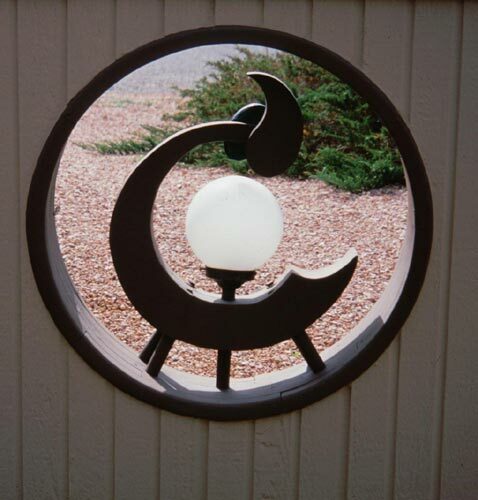 Park and kiosk lighting is powered by photovoltaic installations which are effective, inexpensive, stable, sturdy and safe - especially in an environmentally conscious community like Sedona. 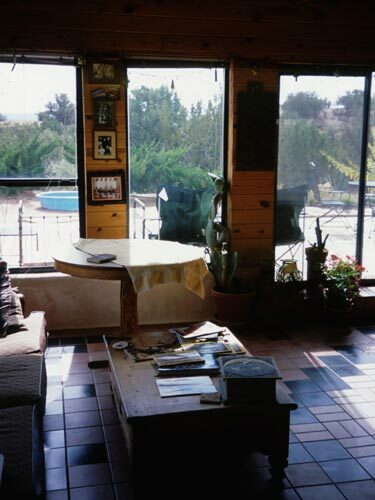 A passive solar house, functioning very well since its construction over 20 years ago, the passive heating system is thermal mass with direct solar gain windows on the south side, and penetrated interior walls to allow for deep penetration of the sun’s rays and circulation of captured south side heat. 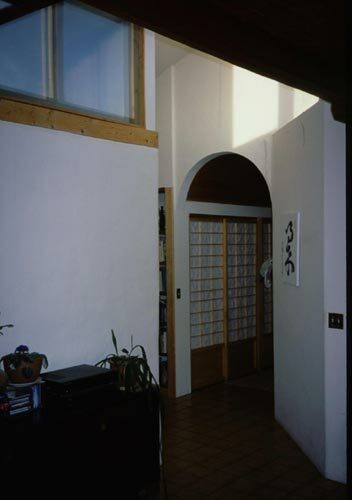 The south side sunspace, a narrow space backed with Kalwall thermal water tubes define the direct sun catching area from the rest of the house and add color as a decorative element. 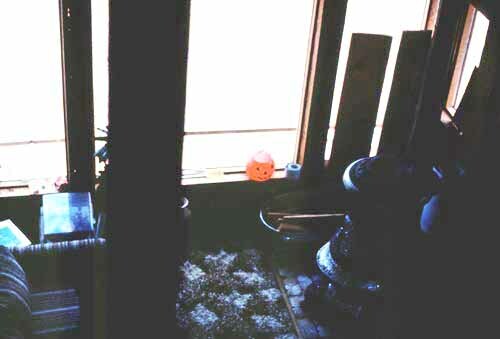 Nestled into the terrain on the north, the north side of the building is earth integrated with earth up to the window sills. 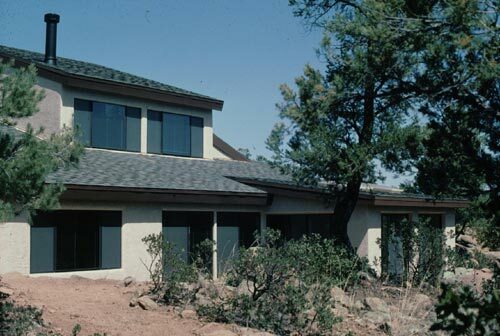 Clerestorey windows and cross ventilation coupled with the thermal mass of the building provide for the cooling in Sedona summers. 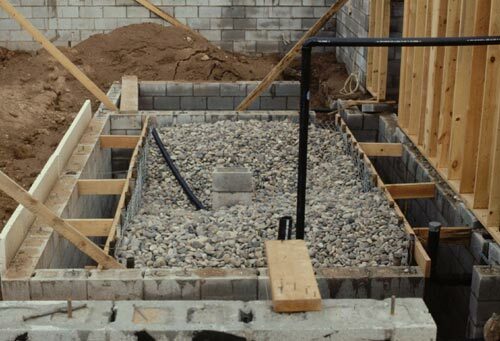 Efficient equipment include a pellet fireplace unit, and energy and resource efficient fixtures. 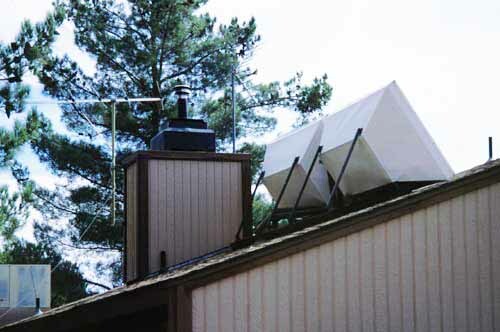 Solar equipment includes 2 batch water heaters which have fully met their needs. 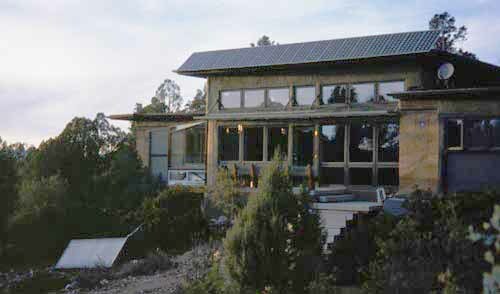 A passive solar heated house utilizing thermal mass, direct gain and indirect gain, and a isolated gain green space. 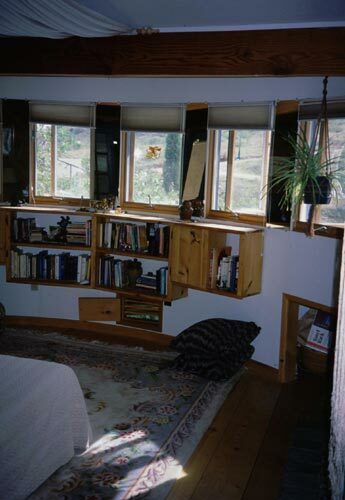 South facing windows coupled with clerestorey windows to allow for deeper penetration of the sun’s rays, as well as the illumination benefits of sunlight. 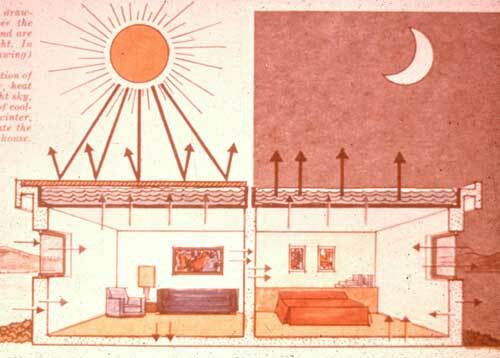 Solar penetration impacts thermal mass in the floors and walls and the building structure absorbs warmth and reradiates it at a later time as the spaces cool in the nights. 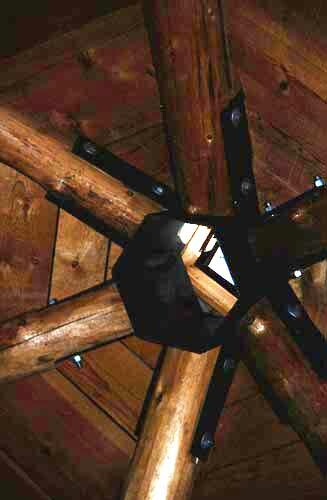 Eaves are calculated for best protection from summer conditions and optimum access to the low winter sun. 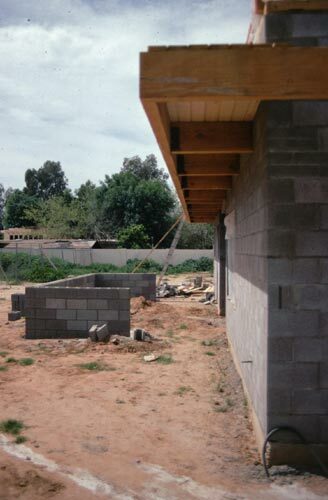 One section of the building eave has designed-in retractable eaves to allow more access of the winter sun radiation. 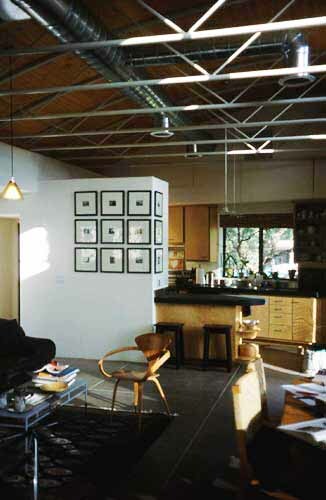 Space planning places living spaces on the south side and secondary spaces on the north. 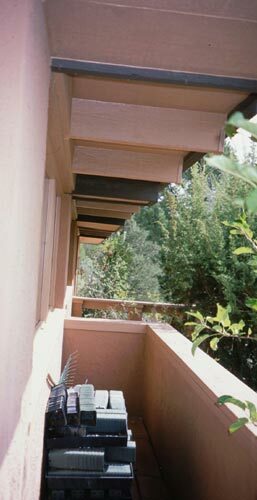 additional north side buffering comes from a raised planter against the north side. 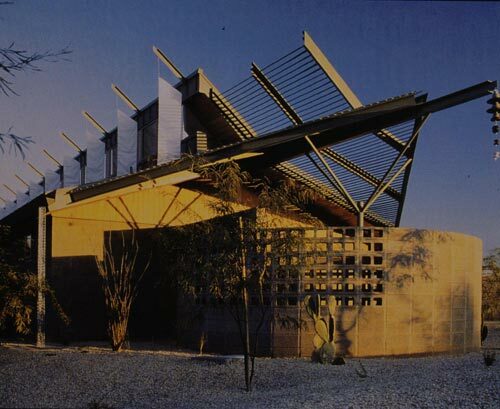 Cooling is attained by the natural attributes of the structure’s thermal mass, effective cross ventilation design, and the operable clerestorey windows. 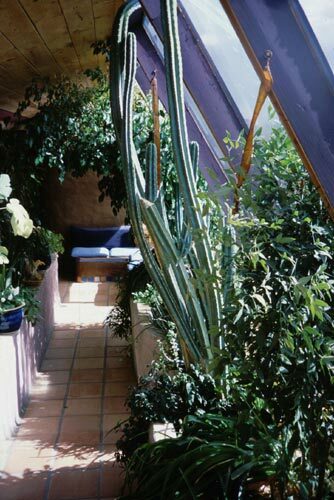 Designed with energy conserving strategies including exterior trellises, as well as surrounding vegetation which creates a zone of coolness. 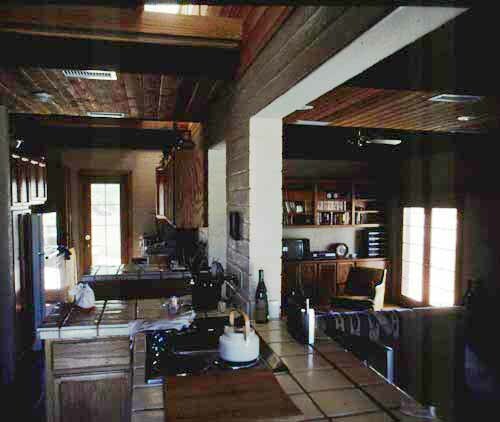 Equipment includes a solar water heater, energy and resource efficient fixtures and an energy efficient fireplace. 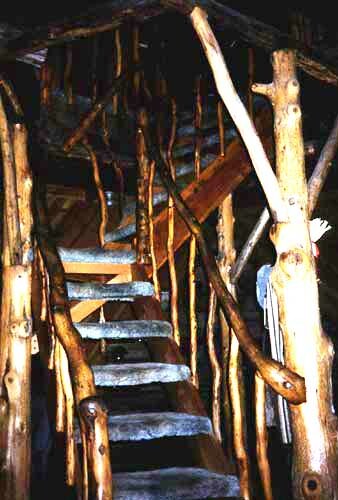 A complex of buildings, grown over time, this facility houses a variety of structures and activities. 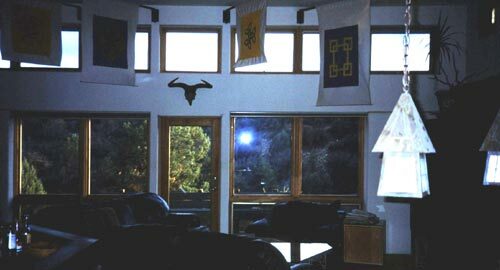 Heating is passive direct solar gain with glazing on the south face coupled with structural thermal mass of the building’s materials. 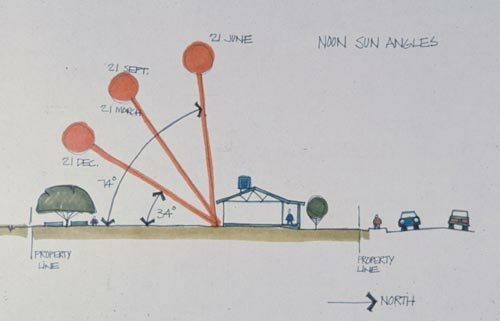 Cooling is by virtue of the inherent capabilities of the thermal mall of the structure, cross ventilation, and effective landscape planning and incorporation. 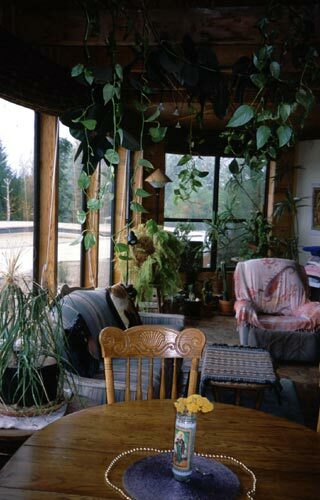 This system provides for a comfortable environment whether it is the living quarters or working areas of the complex. 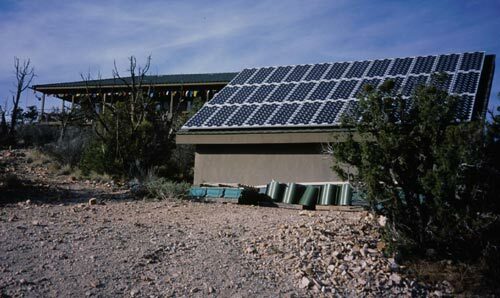 Power generation is by means of several appropriately sited photovoltaic arrays adjacent to the facility they serve. Power for the water tank that sits on the upper hill, power for the residence, power for the guest facility and power for the owner’s business are located adjacent and meet all demands. 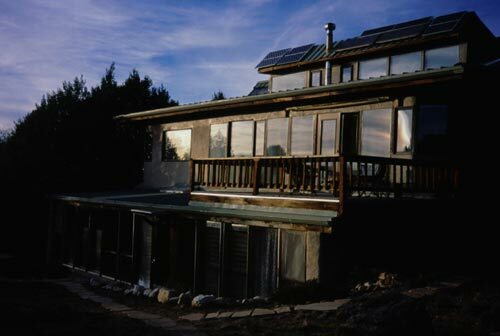 Exterior views, with PV panel, exterior - south facing windows for direct solar gain. 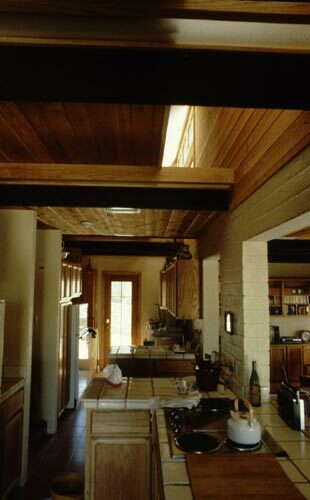 Interiors - south direct gain heating from sunlight, and thermal mass floors and/or walls, solar cooker and solar cat - both benefiting from the sun’s energy. 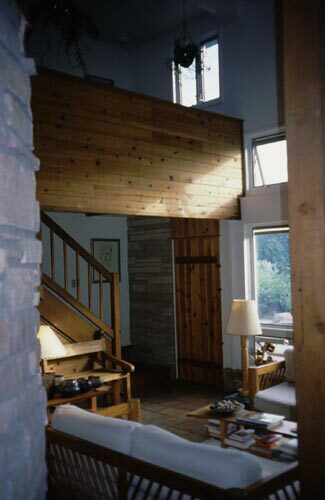 Built in the time of the energy and environmental crises, this house has withstood the test of time and done it efficiently and comfortably. 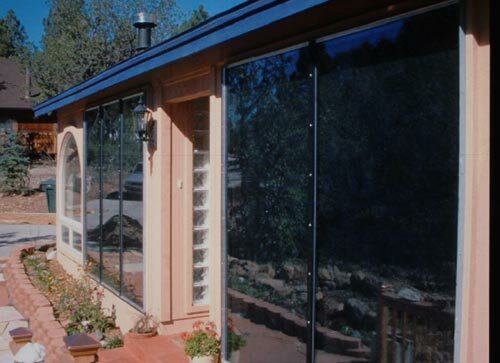 Direct gain solar heating coupled with thermal mass walls and floors continue to attain warm comfort, and effective thermal mass coupled with cross ventilation provide for cooling needs. 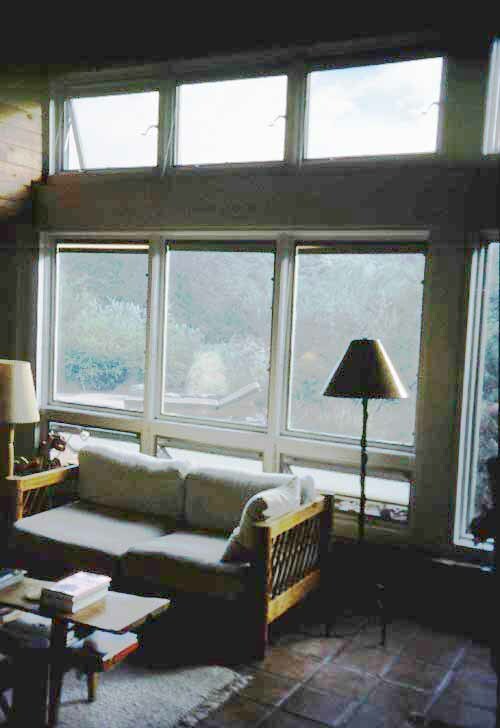 Thermal mass materials, orientation, and a vertical stacking with venting windows capture prevailing breezes or cooler air adjacent to the house and vent out warmer interior air through upper windows. 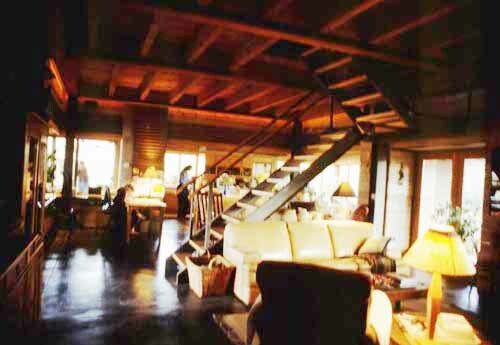 Interior - direct gain space with thermal mass floors and walls. 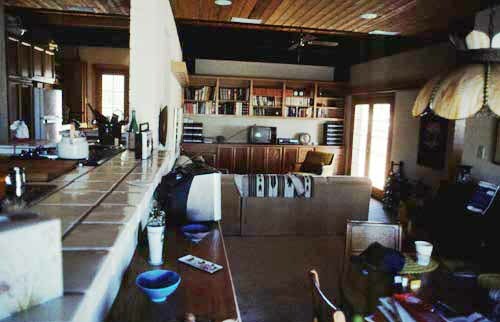 Note thermal mass fireplace. 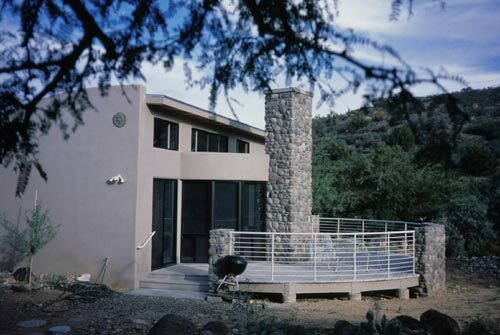 A newly built residence, this simple structure integrates direct solar gain and thermal mass walls and floor to provide heat comfort for the occupants. 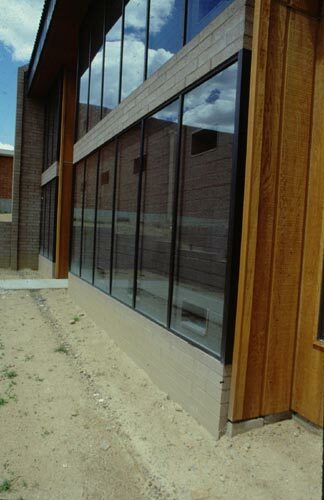 Simple spaces, south facing windows, minimization of east and west exposures, and strong mitigation of north side winter heat loss by means of a recessed entry and entry hall add to the efficiencies of this building. 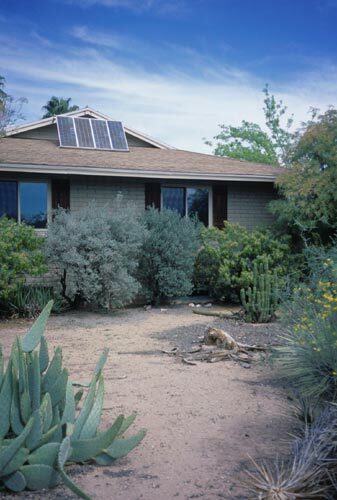 Sedona and the Verde Valley have numerous installations of solar water heaters and photovoltaic panels. 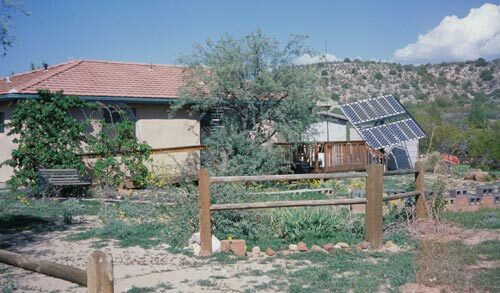 A variety of houses, in a variety of income levels incorporate this equipment as a part of the building’s energy strategy. While some of the water systems are old they are still functioning and meeting the needs of the residents. 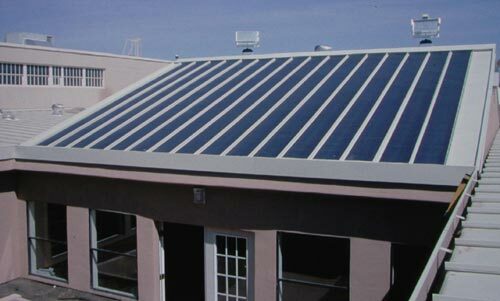 There are variety of solar hot water and PV installations. 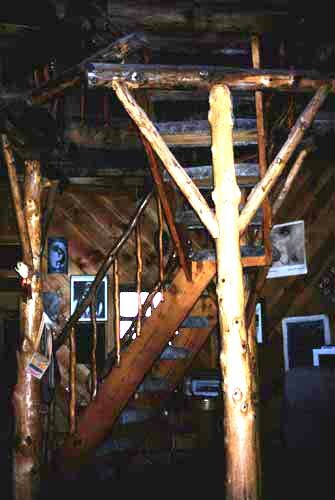 An owner built energy efficient wood frame structure, the living spaced are stacked above a large large rock bin within a highly insulated enclosure directly beneath the living spaces. 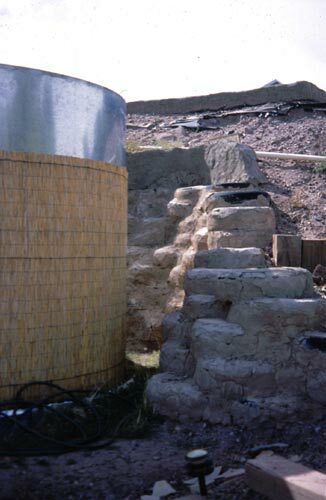 The bin contains a large water tank surrounded by rocks and 2 plenums (ducts). 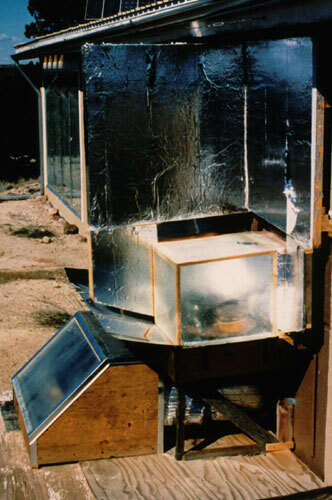 Water, heated at roof top solar collectors, is circulated to the tank which in turn heats the rocks surrounding it . 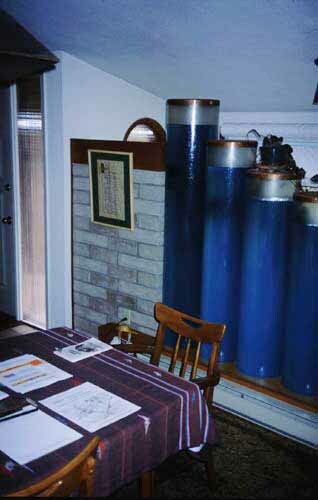 Over the course of the day, constant circulation heats both the tank water and the rocks. 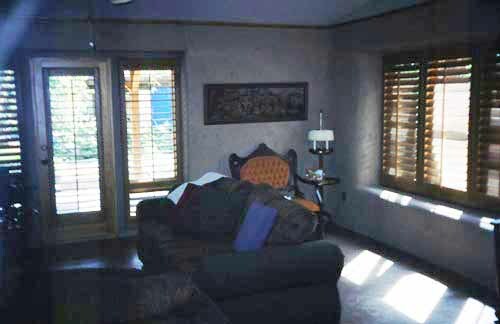 When heating is required, floor vents at the bottom most living space are opened and heated air rises from the bin and up through the house. 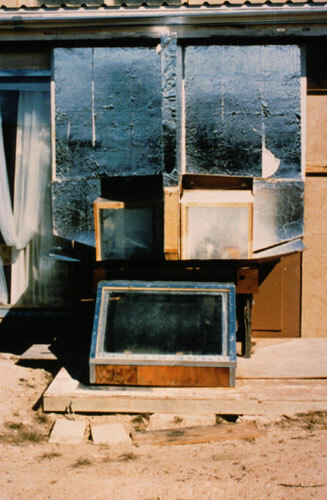 Through “cool side” vents, cooler house air settles into the bin, is heated and rises and repeats the process in a natural convective loop. Hot air rises - cool air settles. 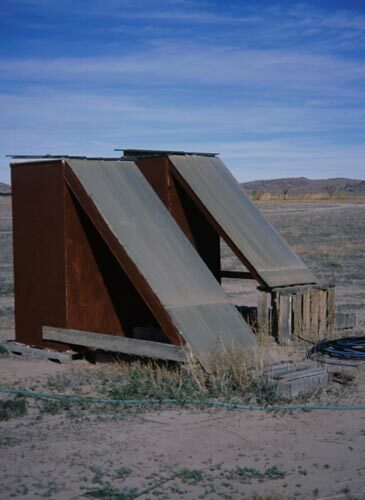 Exteriors - compact vertical form , angular shape to facilitate air movement. 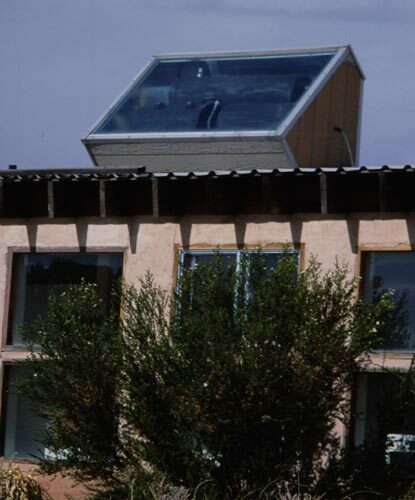 Solar water heaters at building roof. 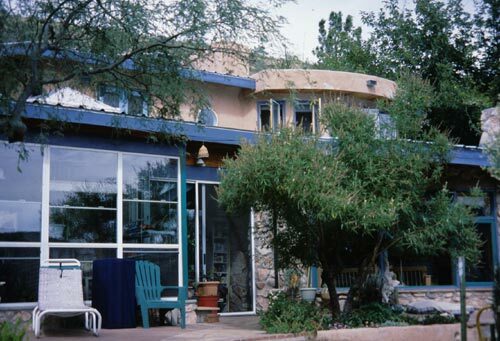 # 1 Residence Payson Az. 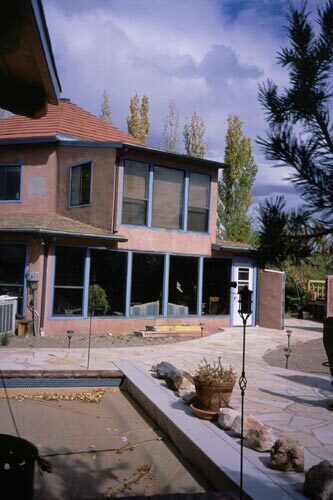 A custom solar and low resource consuming home integrated into the site, with south facing “clearview” collector windows, thermal mass, earth integration and berming, and extensive cross ventilation for cooling. 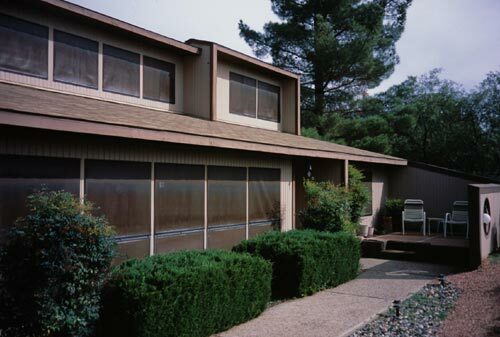 The Clearview collector system is a double window system which contain an operable blind system and interior vents (low and high) to the living spaces. 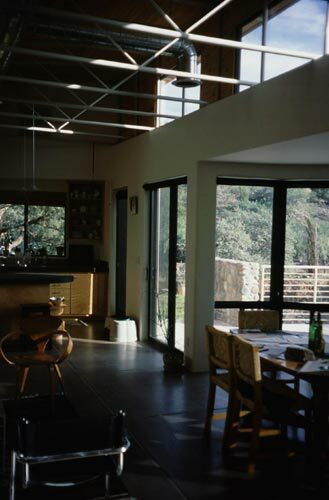 The system allows for direct solar gain into the living spaces by simple raising of the blinds, letting sunlight in to impact the internal thermal mass of the spaces. 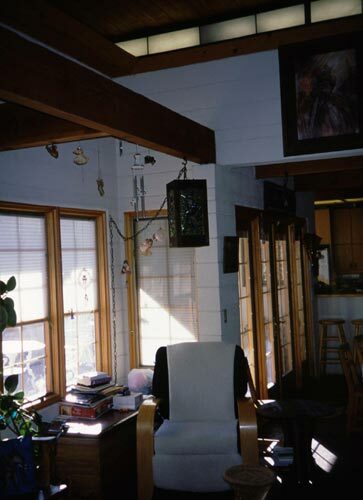 For more control as well as some direct mitigation of the impact of direct solar gain, the operable blinds are 2 colors - one side dark, the other white.. 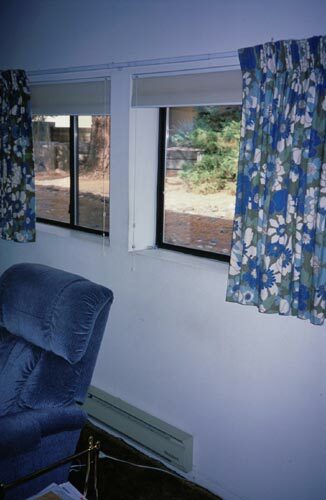 When heating is desired, the blinds are turned so the dark side faces outward and acts as a mini- collector system, heating the air in the double wall window cavity. 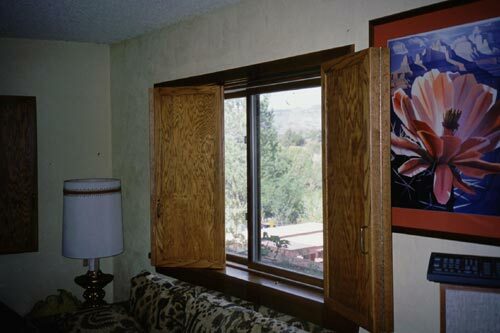 Warm air is introduced into the space by a operable vent at the top of the window system and replacement air is introduced at the vent at the bottom of the window system. 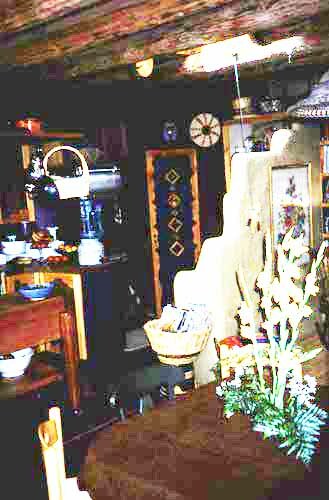 The circulation is natural convection with warmed air being expelled into the living space, and cool air being drawn in from the living space.. 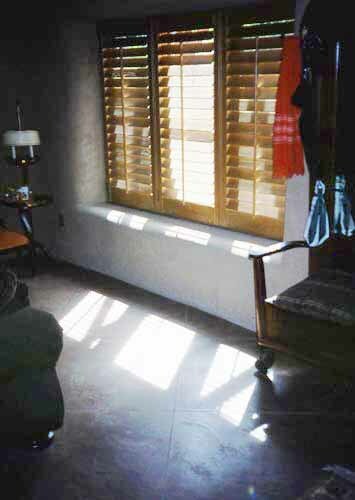 When protection is required to keep the spaces cool, the light side of the blinds are turned to face outward (reflecting unwanted solar light) and excess heat is vented to the outside. 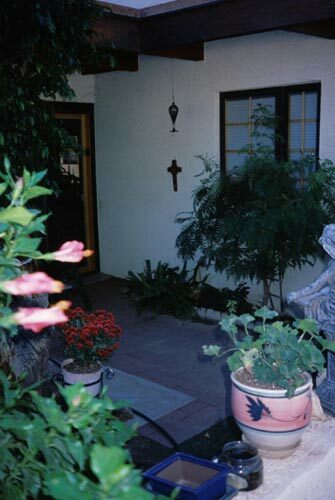 The Prescott area is a place where people have settled for the environmental and climatic benefits of Arizona. 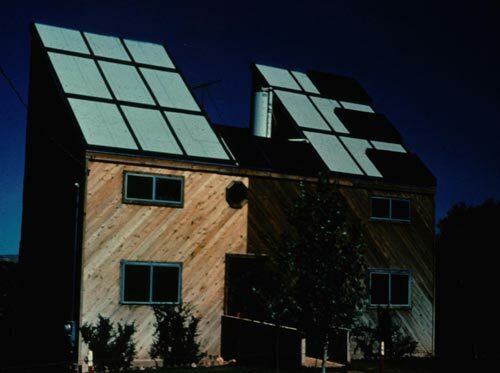 Scattered throughout the area are wonderful building and homes incorporating natural systems and solar design for heating of buildings, and incorporating solar equipment of water heaters and photovoltaic panels for off grid production of electricity. 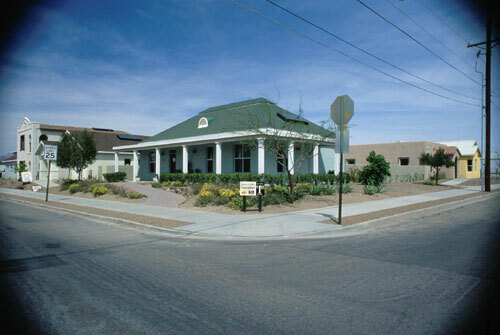 Buildings vary from small experimental structures to banks and medical complexes, and range from new to old. 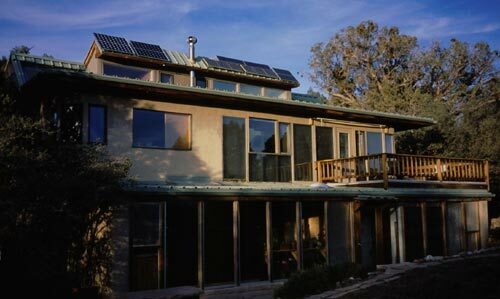 A compilation of a variety of construction materials and systems from straw bale to adobe used in various forms, this house is located within a heavily vegetated area that precludes simple direct gain approach to high country solar heating. 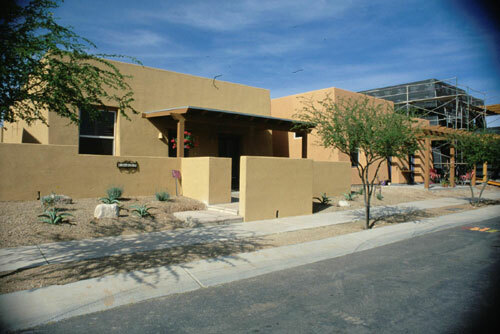 The building concentrates on energy conserving strategies of energy efficient walls to prevent heat flow (either outward or inward); incorporation of thermal mass for both a heat and cool storage; a compact form with spaces stacked upon each other; shading for cooling; cross ventilation; and resource conserving equipment and fixtures. 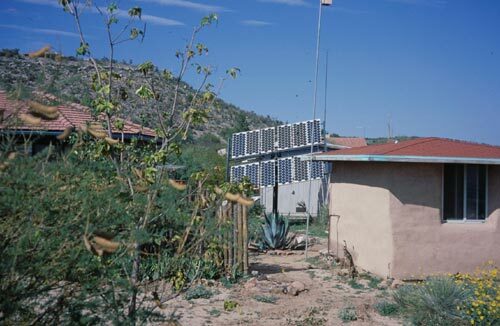 Solar equipment is mounted on the roof of the two storey structure in order to have unimpeded access to the sun and includes both photovoltaic panels for electricity production as well as solar water heating. A Buddhist temple and learning center, this facility is totally off-grid and generates its’ own power through an array of photovoltaic panels mounted on the roof of the structure which houses its equipment and storage batteries. 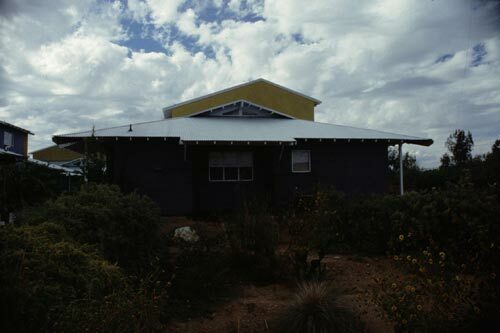 This experimental farm of Prescott College is looking into the agricultural benefits and possibilities of indigenous crops like the wolfberry. 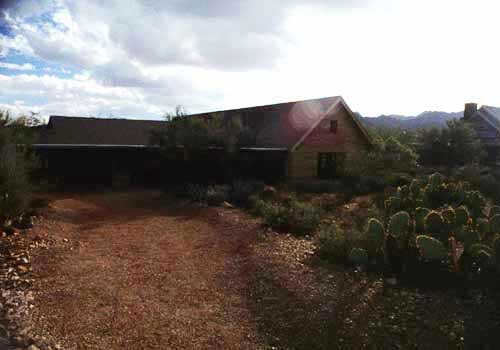 The farm contains a student built straw bale structure with a photovoltaic installation and experimental solar crop dryers. 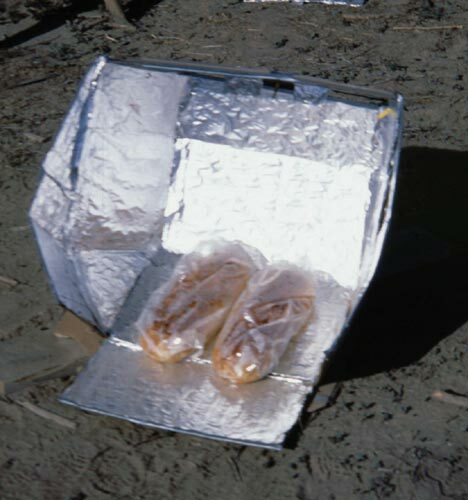 The students prepare their food by means of a variety of home-made and commercial solar cookers. 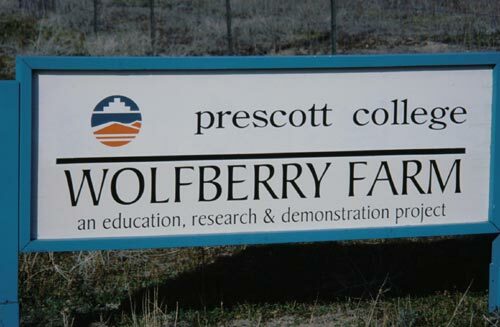 For more information regarding the Wolfberry Farm Project, contact Prescott College. 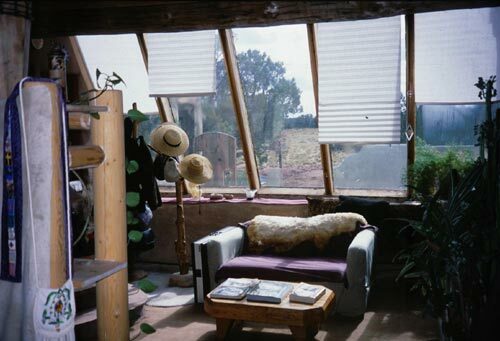 Note the straw bale farm structure and the solar crop dryer structure - with south facing glazing. 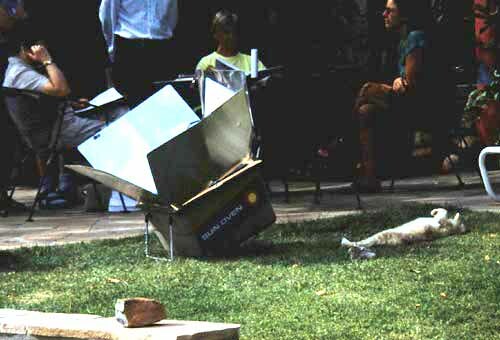 Various solar cookers. 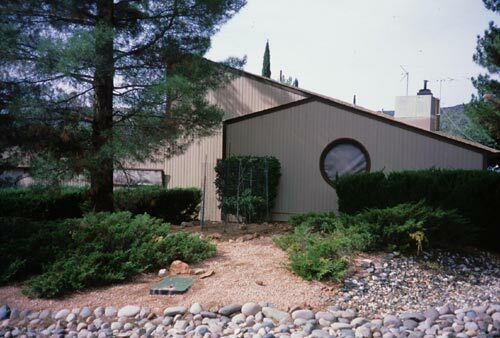 A professional medical building with some passive solar heating elements including direct gain enclosed entry terrariums, direct gain windows and thermal mass for heating. 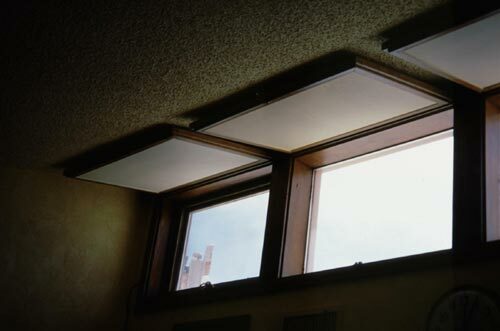 and Kalwall thermal skylights with movable insulation. 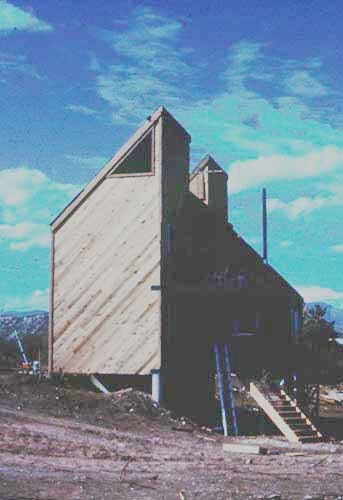 A professional building incorporating a Trombe wall for heating. 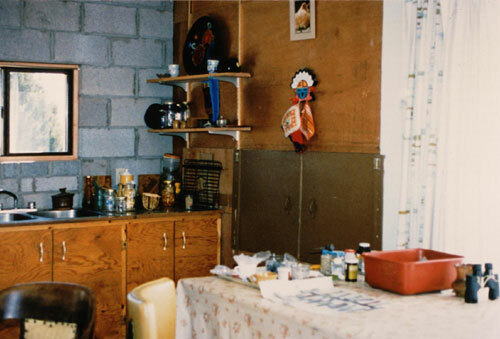 The system, invented by Frenchman Felix Trombe, is simply a dark masonry wall with upper and lower vents to the building interior, and faced (4-6” away) by windows. 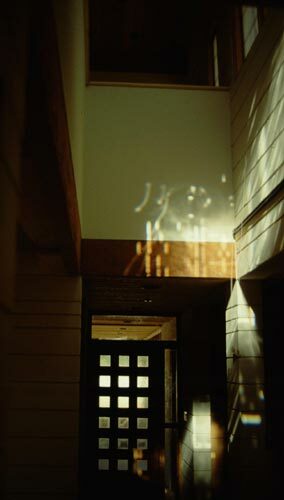 Sunlight streams through the glass, strikes the dark masonry wall and heat the air in the space. 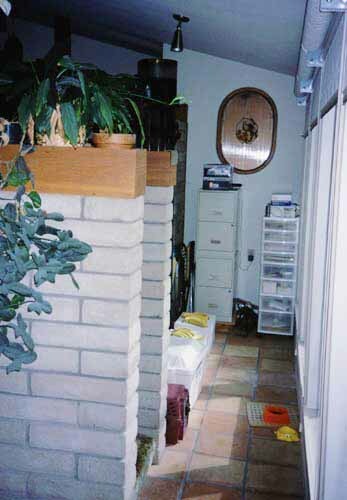 Heated air rises and vents into the adjacent space through upper wall openings and cooler replacement air is drawn into the space through lower wall vents. Circulation is by natural convection. 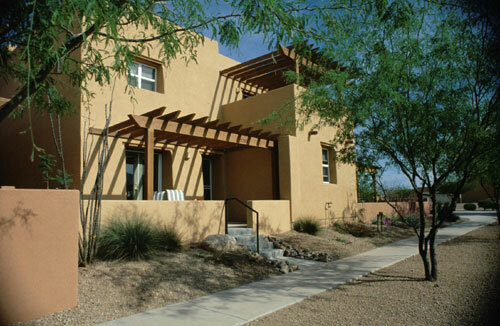 A residence that combines both passive and active systems, this multi-level home incorporates south facing direct solar gain and clerestory windows with thermal mass walls and floors for heating; penetrated interior walls for letting sunlight into deeper interiors; stacking of spaces to have more south room exposure; cross ventilation coupled with thermal mass for cooling; and integration of active systems equipment of photovoltaics for power generation and solar water heating system for hot water. 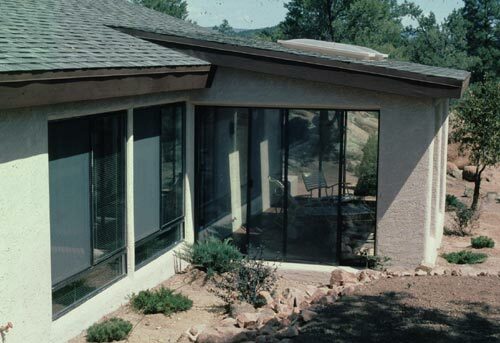 Exterior - south face with direct gain glazing. 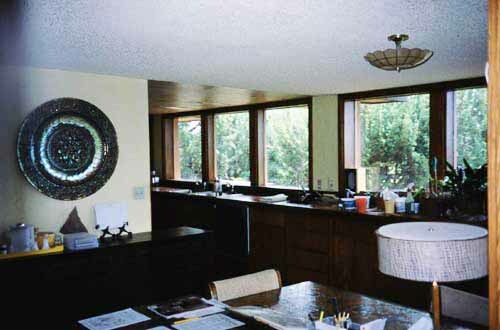 Interior - windows and thermal mass. 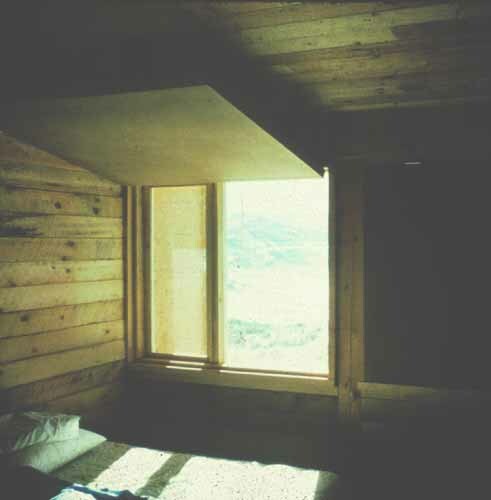 Interior - sunlight and thermal mass interior wall which allows penetration of sunlight from clerestorey window deeper into the building. 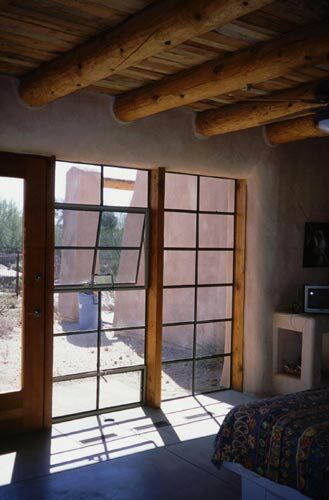 Direct gain window wall and thermal mass floor and walls. 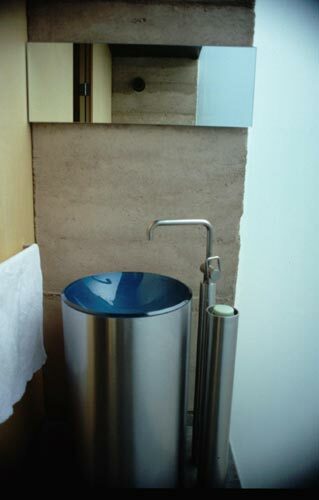 Vertical water heater in front of soaking tub made from a drinking trough. 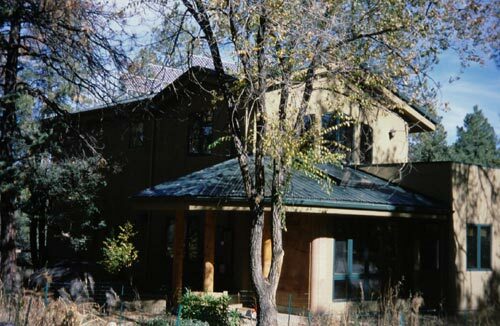 Another passive/active combination solar house - Direct gain south windows and building structure thermal mass of cast earth with photovoltaic panels incorporated at the building’s southern roof overhang section. 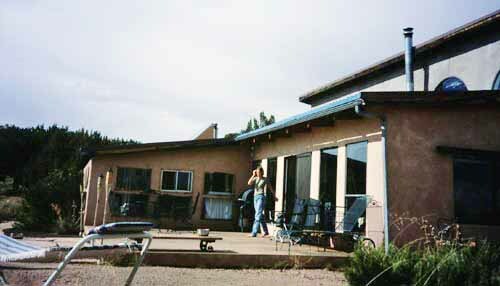 A thermosiphoning passive water heater system is located down slope of the residence and provides solar heated water to the residence. 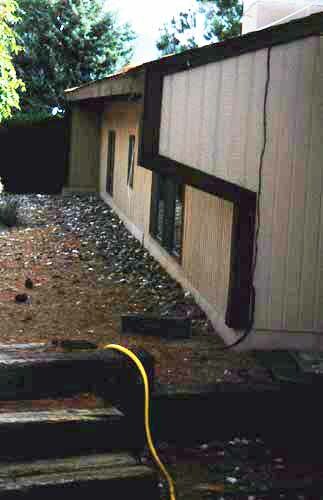 Exterior - south facing direct gain glazing; thermosiphon water heater. 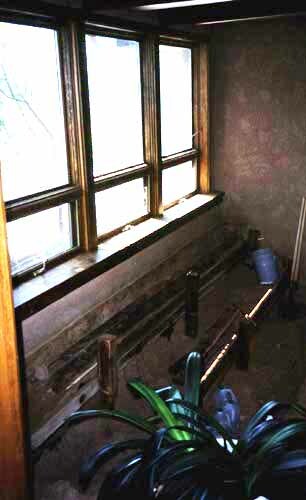 interior - high window direct solar gain (heating) and ventilating (cooling). 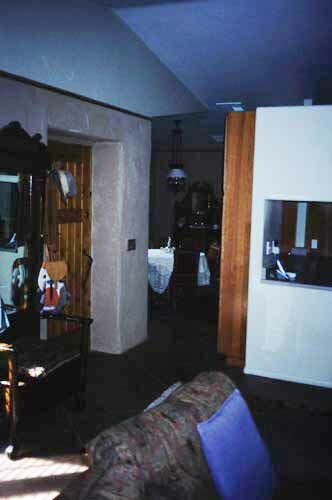 A direct gain, thermal mass residence providing sufficient heating for this residence. 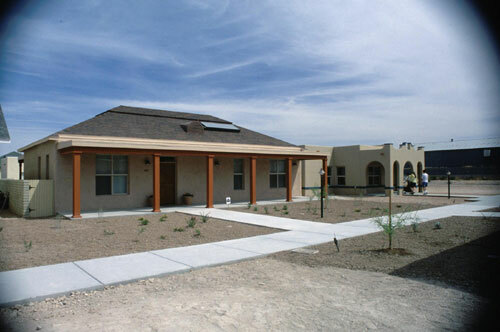 An energy efficient residence with photovoltaic panels and wind generator for electricity generation. 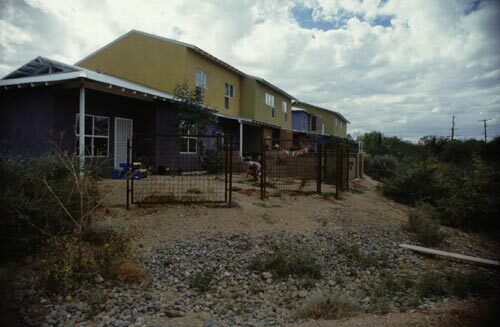 The “Old Pueblo” is replete with solar activity and buildings. 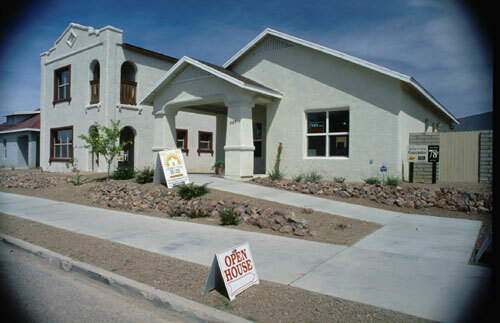 The annual Solar Potluck put on by Citizens for Solar; the Civano development - a major step in providing solar and resource housing in southern Arizona; the Armory Park infill project, and the annual Tour of Innovative Homes and annual Hot Topics/Cool Solutions conference are all examples of a commitment to Living With the Sun- Arizona Style. 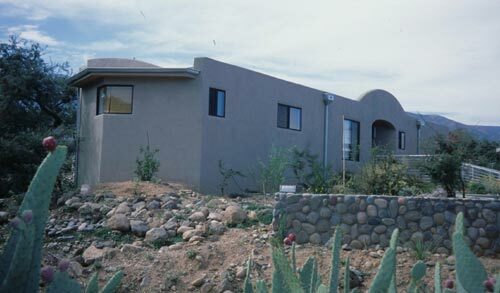 This energy efficient straw bale residence responds to the intense dessert heat in its compact form and highly insulating building material, coupled with the thermal mass floors which assist in keeping the living environment cool in an efficient manner when coupled with high efficiency, low energy equipment and early/late season cross ventilation. 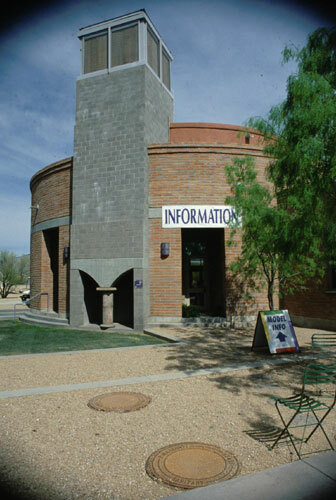 Reflective white roof and light building color adds to the energy efficient attributes of the building. 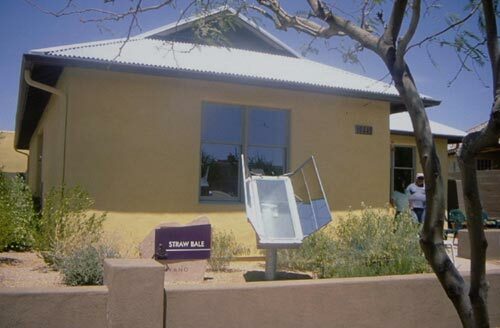 Residence has a permanent solar oven installed as a basic feature of the houses’ Living With the Sun approach. 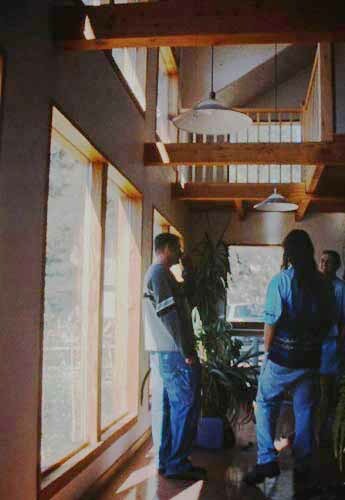 This multi family project uses orientation, careful location and sizing of windows for optimum mitigation of undesirable summer conditions. 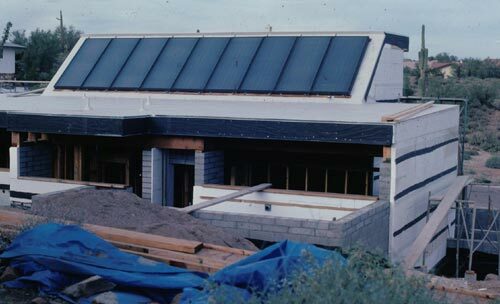 The Straw Bale Common House contains a 2 kw grid tied photovoltaic system and will be incorporating solar hot water heaters. 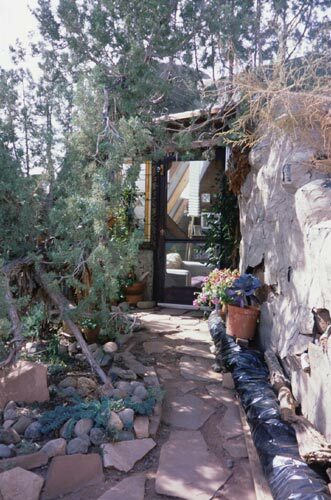 The lush xeriscaped landscaping with permaculture strategies provides for environmental tempering. 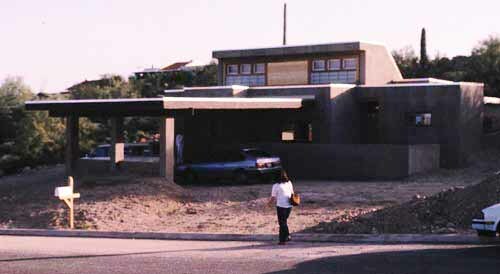 Part of an infill project in Tucson’s historic Armory Park area, this residence incorporates passive solar dessert design features of orientation, thermal mass walls and floors, careful consideration of location and sizing of windows, cross ventilation, and incorporation of solar water heaters and photovoltaic panels for electricity generation, into a form that emulates the historic character of the district. 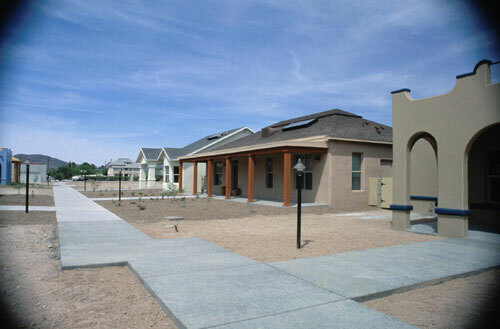 One of the first solar and environmental subdivisions in Arizona, Civano shows that good solar, environmental and natural resource design and construction can be successful in the open market. 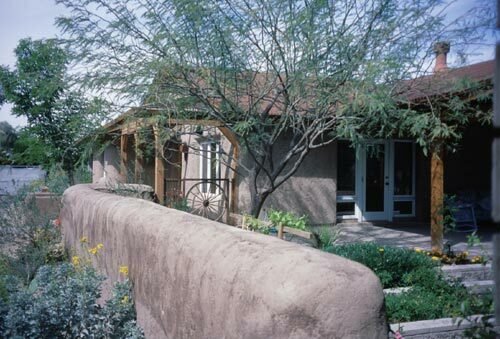 Homes range in construction from earthen materials like adobe to contemporary, energy efficient C.I.Ps. All must meet Civano energy and resource standards which are some of the most stringent in the country. 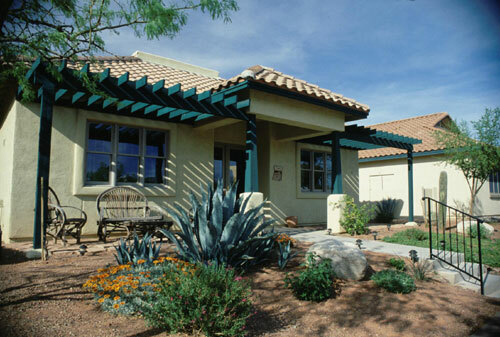 The variety of design, materials, construction, passive and active solar applications, natural heating/cooling systems and highly efficient mechanical systems, and resource conserving elements of efficient water utilization and desert appropriate landscaping practices reflect the Living With the Sun - Arizona Style success. 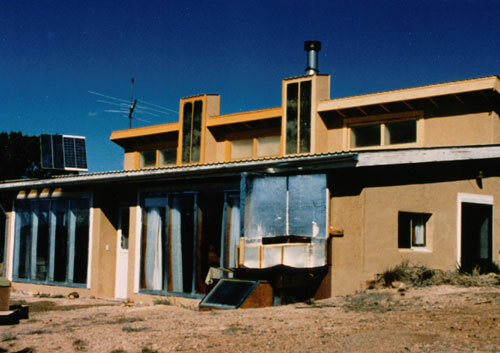 Earthen materials with environmental common sense, this high insulation (r-30 walls, r-50 roof), this high thermal mass, earth integrated rammed earth residence as solar assisted hydronic heating. 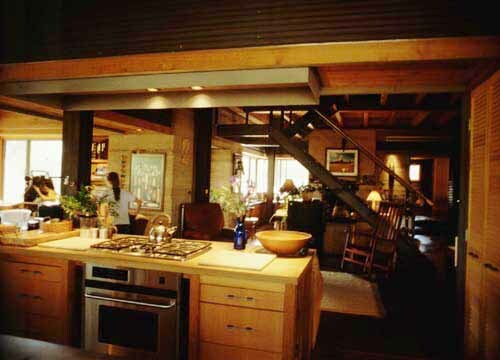 Recycled materials for interior framing integrate with environmentally tempering porches, natural ventilation, radiant barriers and permaculture strategies to provide summertime comfort. 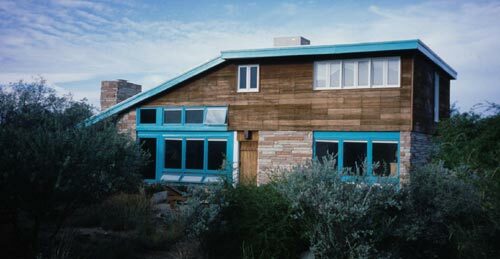 Designed to fit in with the neighborhood, this contemporary architectural studio of exposed rammed earth walls and weathered steel materials, enclosed courtyard encompasses passive design strategies of high thermal mass, high insulation, and appropriately placed windows. 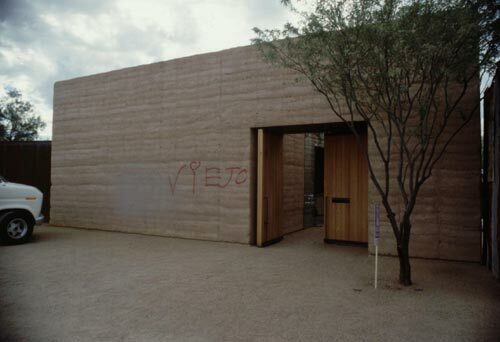 A classical territorial barrior design, this building incorporates a lush interior court, and recycled materials for structure and building elements, into a rammed earth structure which is the thermal mass component of the natural cooling system of the courtyard and cross ventilation design. 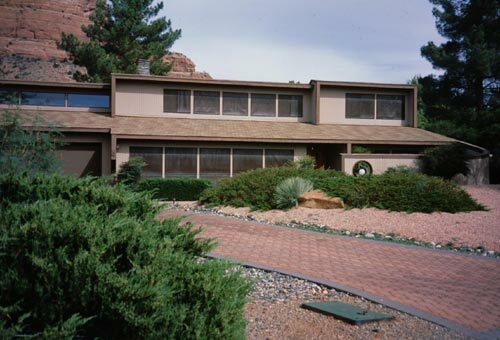 High performance mechanical cooling system is available, and a radiant floor heating is incorporated. 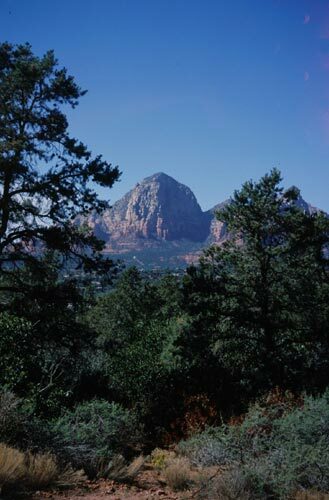 The Valley of the sun is impacted with intense summer sun and benign winter conditions. 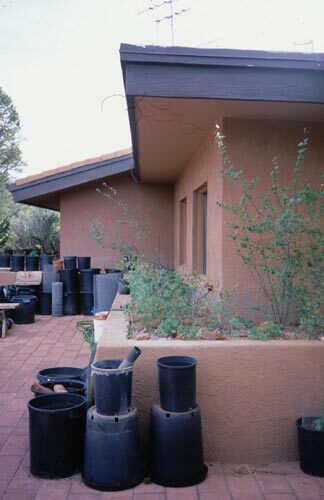 Strategies for dealing with intense summer heat and mild winter conditions range from integrating into the earth to roof ponds. 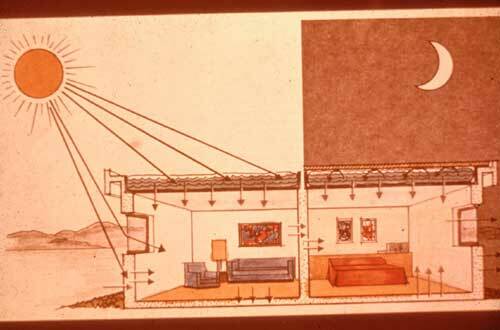 Combinations of thermal exclusion coupled with daylighting and viewing inclusion result in a variety of Living With the Sun expressions of form and shape. 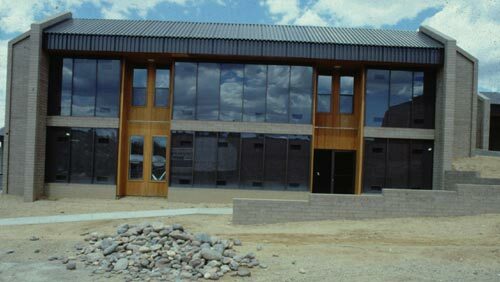 The building is burrowed into the site to gain as much of the thermal benefit and barrier to heat as the earth can provide. 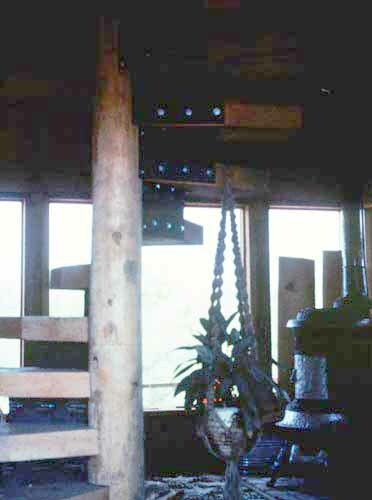 This “Earthship” construction is of interlaced tires filled with compacted earth, plastered on the inside and out, providing very thick and dense walls which act as a barrier to unwanted summertime heat. 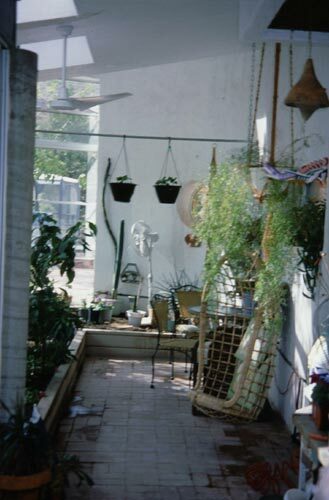 A central landscaped atrium provides natural light and a cool outdoor environment to all the interior spaces, and an earth integrated cool tube system provides earth tempered air to the mechanical cooling systems. 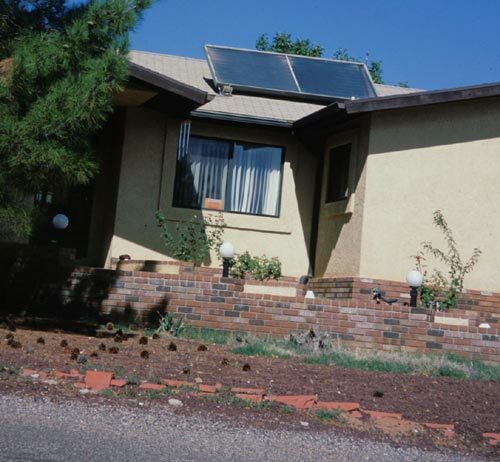 Active solar systems include photovoltaic panels for electricity generation, and solar water heaters. These systems, coupled with high efficiency, low resource demand equipment and fixtures, provide for the needs of the facility. 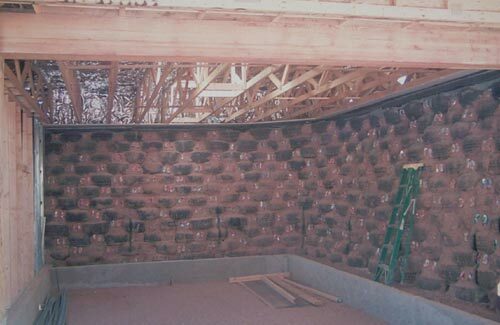 Interior of tire/earth wall prior to plastering. 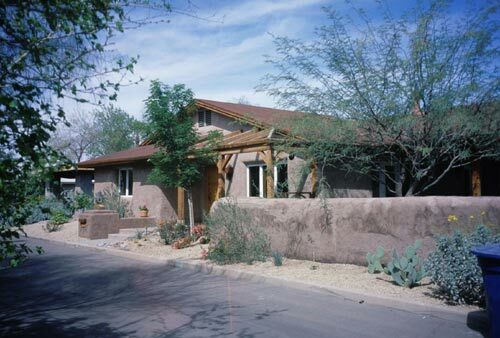 This desert straw bale residence is part of the City of Scottsdale’s Green Building Program. 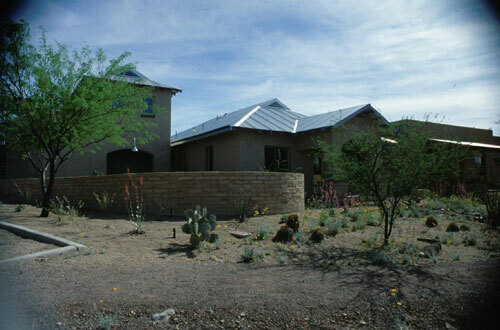 Living With the Sun strategies include orientation, highly insulated building shell (straw bale construction, highly insulated roof, energy efficient windows, shelf shading structure ( window shading wing walls), thermal mass plenum floors for heating and cooling, a cool tower (gravity driven evaporative cooling system), and cross ventilation cooling. 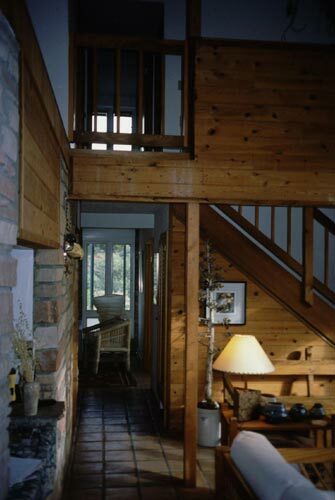 Heating is achieved by direct gain south windows, floor thermal mass and an energy efficient fireplace. 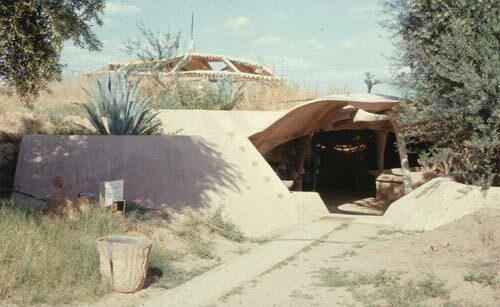 The Cosanti Foundation’s location and demonstration of Paolo Soleri’s vision and applications for Living With the Sun. Earth integration, whole site planning, vegetation and shading, cool courts and warm courts, thermal mass as both barrier and heater, and direct gain applications. 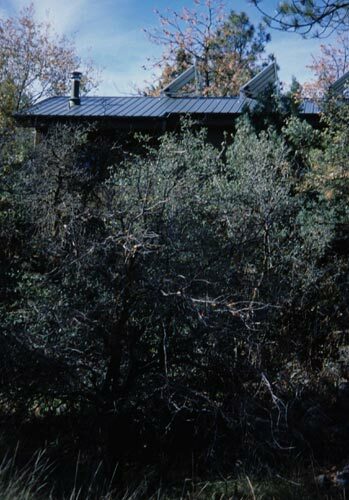 This compact, energy efficient, solar residence backs into a north facing slope and capitalizes on the inherent coolness of the earth and the down slope fall of cool summer evening air, as well as thermal mass walls with insulation on the exterior; terraced space planning to allow falling cooled air to cascade downward through the structure; thermal chimney effect of a raised central spine which also provides natural light at the building core; cool court and warm court integration; cross ventilation; and solar water heating. 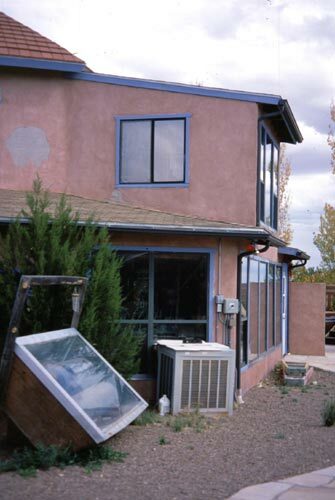 Built over 20 years ago, this house was the basis for a Department of Energy demonstration of the applicability of roof ponds for heating and cooling of buildings. 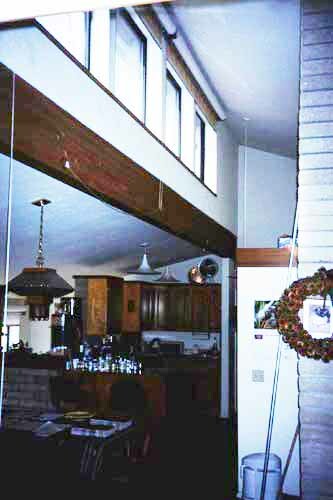 This high mass house - 6” of insulation sandwiched between 2 3” layers of concrete structure and 12” of contained water on the roof used the thermal absorption and release capabilities of water to attain comfort. 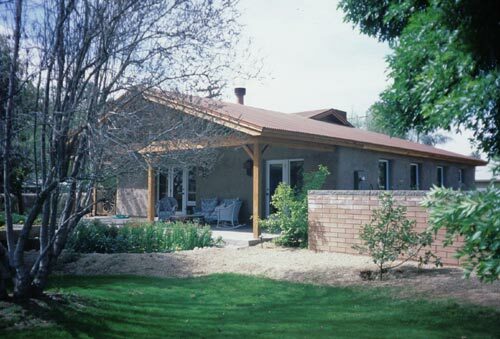 The house structural elements are in fact the heating and cooling system and replace conventional ductwork, plenums, and mechanical heating and cooling systems. 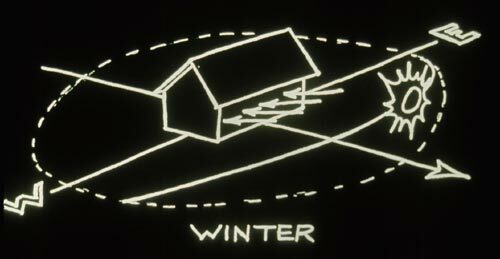 Winter heating is achieved by exposing the roof ponds to the daytime sun then covering them at night with movable insulation. 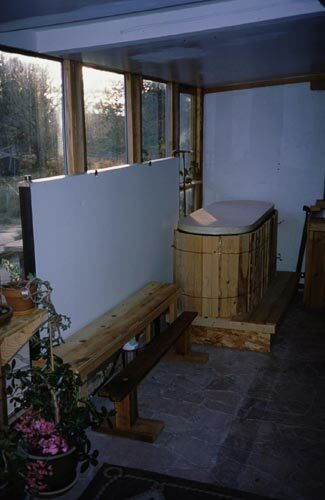 The warmed ponds transfer their heat through standard metal construction decking ceilings which act as a radiator. 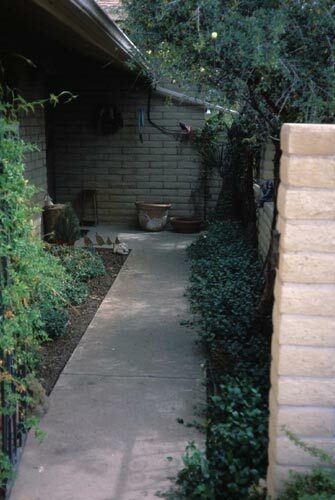 Summer conditions use an opposite action - Ponds are covered during the day thereby staying cool and act as a thermal “sponge” absorbing undesired heat from within the building and hold it until the evening where it is disposed of through night sky radiation, air movement convection, and evaporation by means of gently misting the water bags. 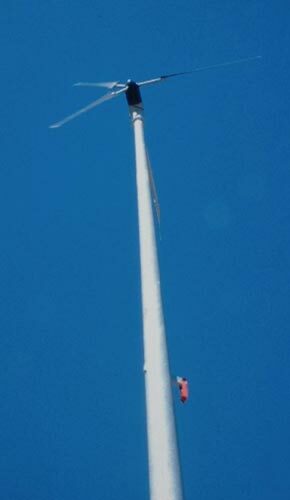 Panels are moved by a 1/3 hp motor which runs for about 3 minutes during the opening and closing process. 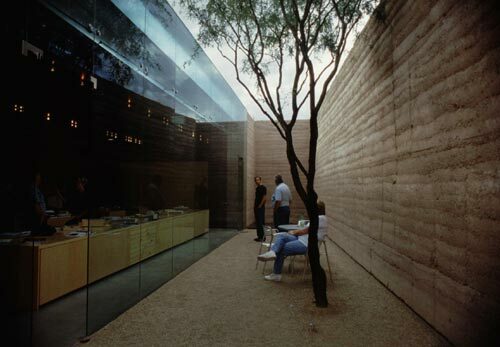 The building embodies other dessert strategies such as rough textured walls, recessed window and door openings, cross ventilation; an energy efficient Rumford fireplace design; low resource fixtures and equipment, and a solar water heater. 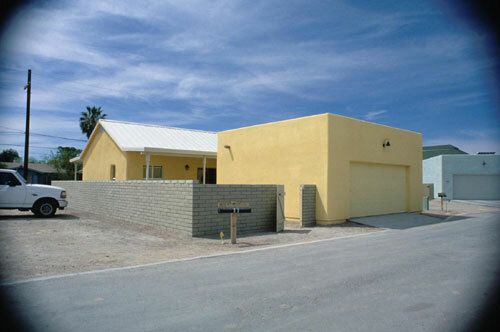 A compact residence with cool and warm courts, high thermal mass insulated on the exterior, structure. 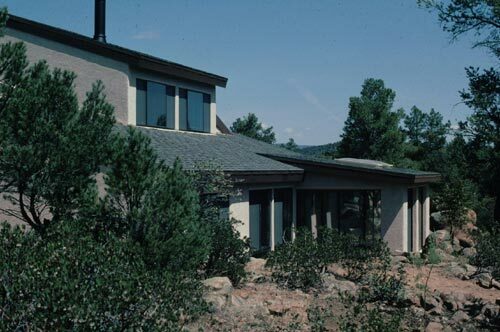 Direct gain for wintertime heating and high mass thermal “sponge” walls with cross ventilation and resource efficient equipment for cooling, this residence incorporates a 2 story interior thermal volume and clerestorey windows at the second floor to vent unwanted heat. 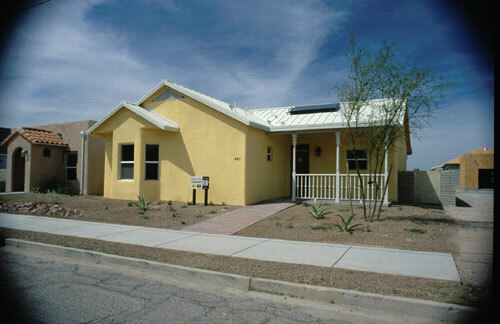 A demonstration of a variety of Green, energy efficient and solar applications, the building’s Living With the Sun attributes include proper orientation, thermal mass, careful placement and sizing of glazing, clerestorey window incorporation for natural lighting, cross ventilation, direct gain south windows, cool court and warm court integration, landscaping and site amenities, energy and resource efficient fixtures and equipment, “green” materials and finishes, and solar applications of a photovoltaic panel and a solar water heater. 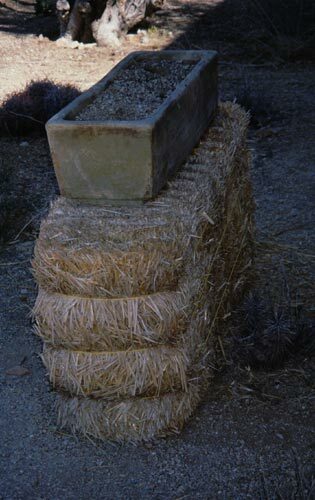 This compact , energy efficient structure is the first straw bale construction in Tempe. 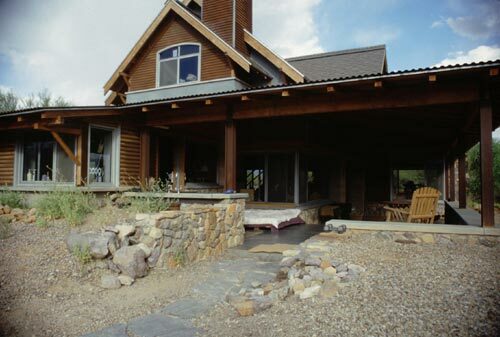 The highly insulating walls of mud plastered straw bale load bearing walls, coupled with the thermal mass of the stone fireplace and exposed concrete floors provide a condition where a minimum of mechanical energy is required for heating or cooling. 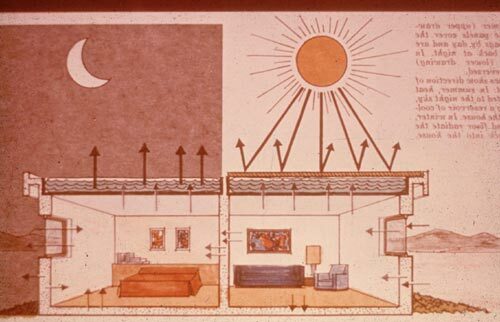 The barrier of the walls prevent heat flow from or to the outside, and the thermal mass retains both warmth and “coolth” to maintain comfort with only a 3 degree temperature swing during the day. 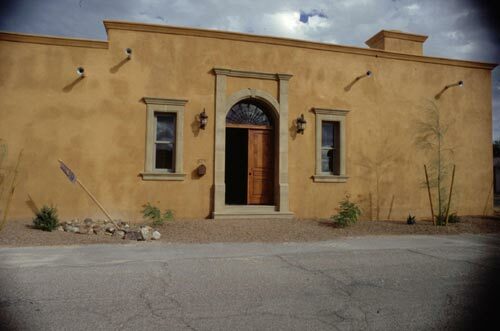 High insulative values of the walls and the roof (r-50+) mitigate the flow of heat and assure a stable environment which results in less mechanical cooling and heating operations. 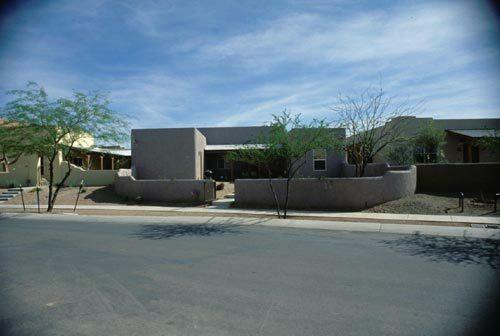 This passive and active systems residence has functioned through 20 years of Arizona dessert summers and winters. 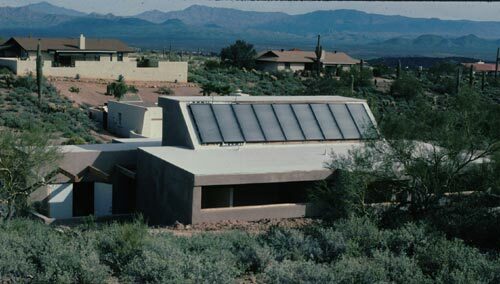 Combining passive solar techniques of solar orientation, elongated building form along the west/east axis, earth integration (a below grade living space), thermal mass, thermal screening, indigenous landscape for summer heat mitigation, and cross ventilation, with active solar systems for hot water heating, photovoltaic electric generation to power elements of the house and yard lights, solar pool heating the house also contains energy efficient appliances and fixtures. 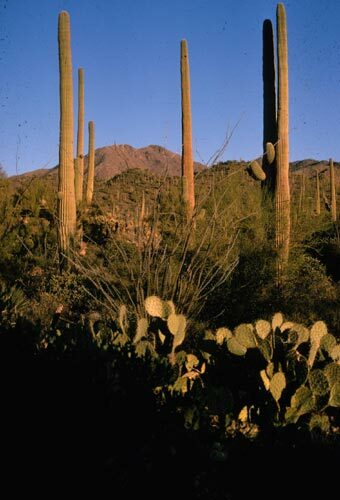 Arizona is a land of extremes and variation. 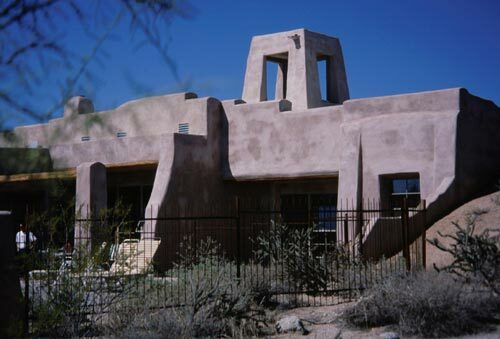 Arizonans have adapted to, and adopted the natural conditions and resources of Arizona sites and climate to create habitations that are energy efficient and resource appropriate. 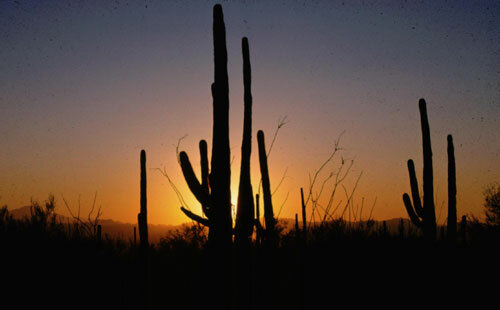 Throughout Arizona there are a variety of actions that have been and are continuing to be taken by Arizonans who are incorporating the elements of nature - the sun, wind, earth, and water, simply and directly to meet their needs. 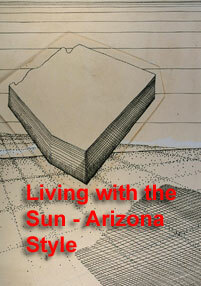 These actions are the basis of Living With the Sun - Arizona Style. 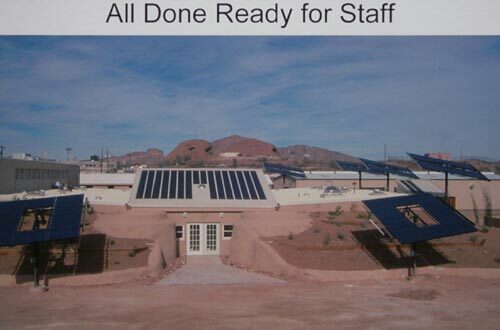 This presentation was constructed by the Arizona Solar Energy Association for the Arizona Solar Center, Inc. under contract with the Arizona Dept. of Commerce Energy Office, funded by the Dept. 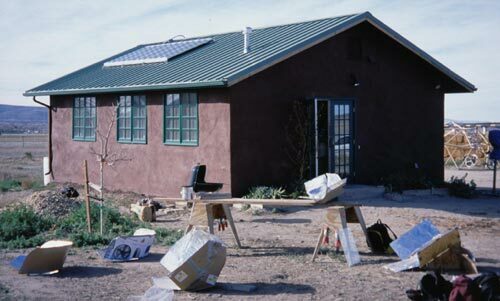 of Energy Million Solar Roofs program. 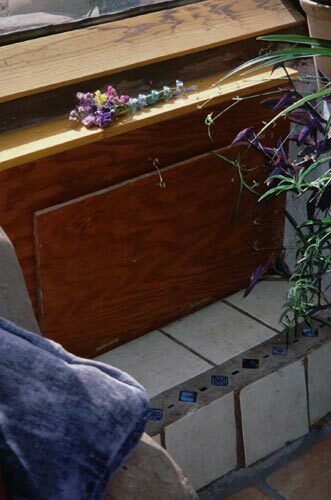 Materials and information were provided by a number of sources. 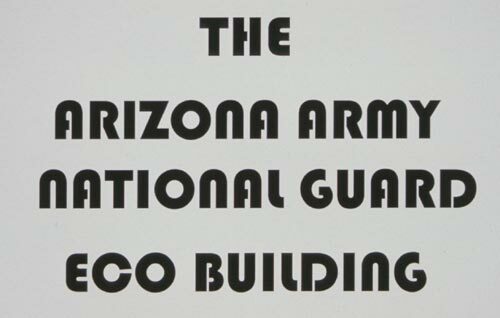 Financial support for this presentation has been provided by the Arizona Department of Commerce (Energy Office) and the U.S. Department of Energy through (DOE) Grant No. DE-FG51-01R021250. 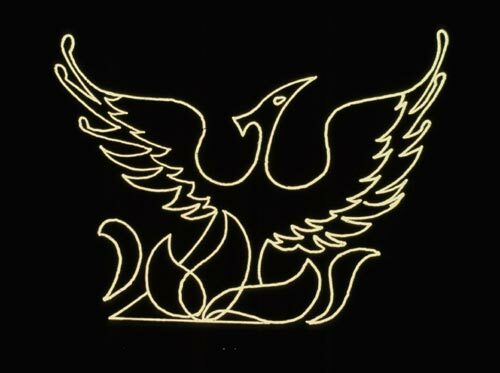 However, any opinions, findings, conclusions, or recommendations expressed herein are those of the author(s) and do not necessarily reflect the views of the Energy Office or U.S. DOE. 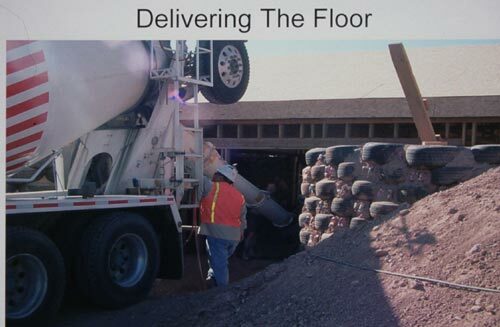 The State of Arizona and U.S. DOE assume no liability for damages arising from errors, omissions or representations contained in this presentation.